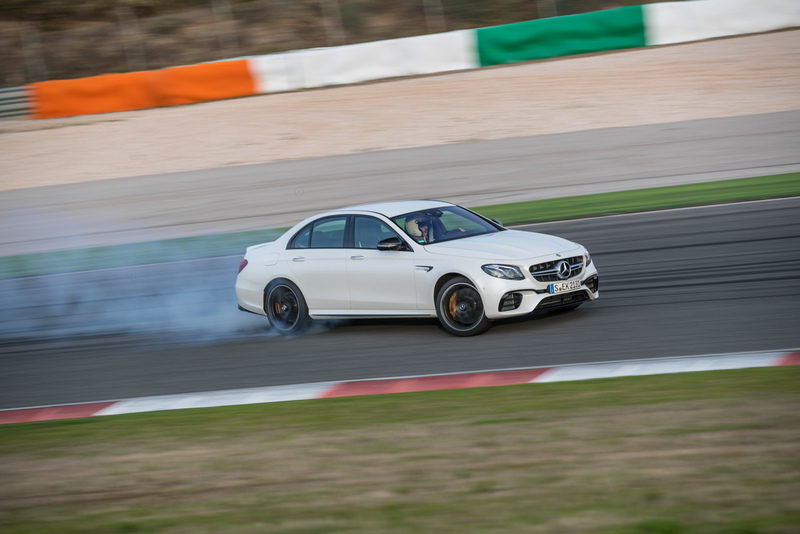 Smoke, brute force, the smell of burning rubber and a thrilling sound, chances are high that something along those lines comes up when you ask any petrolhead about the E63 AMG. 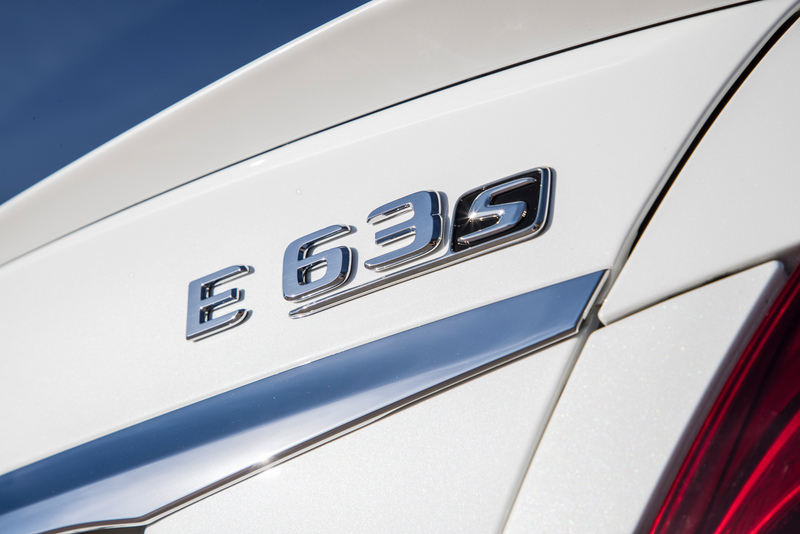 From ‘der Hammer’ to the latest generation E63, they all earned their place in the world’s car community. 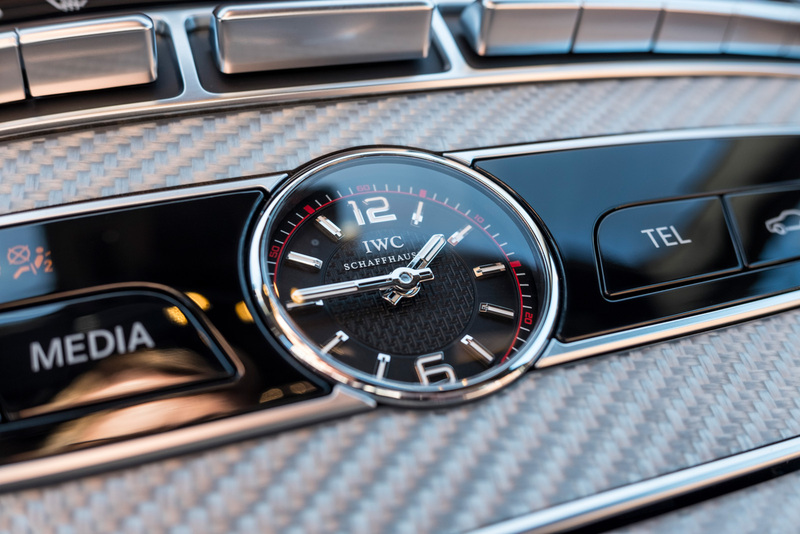 To many it is the epitome of sheer brutality disguised in a business suit, a true wolf in sheep clothing, if you will. 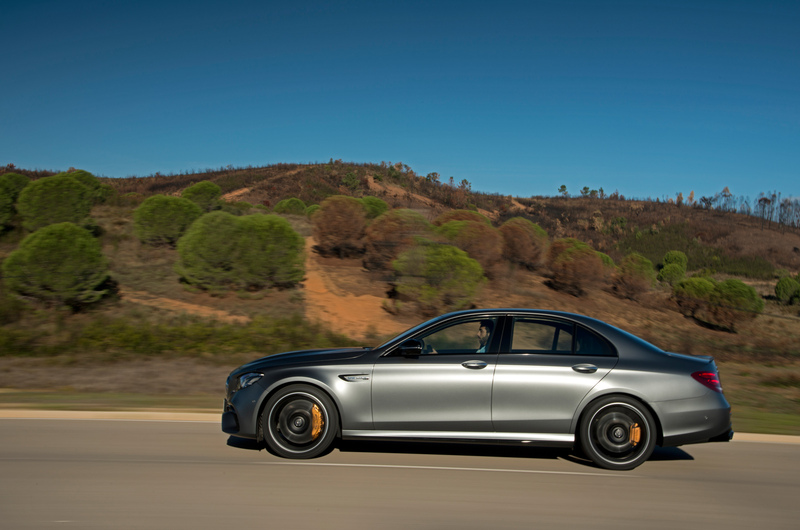 For me, the new Mercedes-AMG E63 S was easily one of the cars I was most looking forward to drive this year. 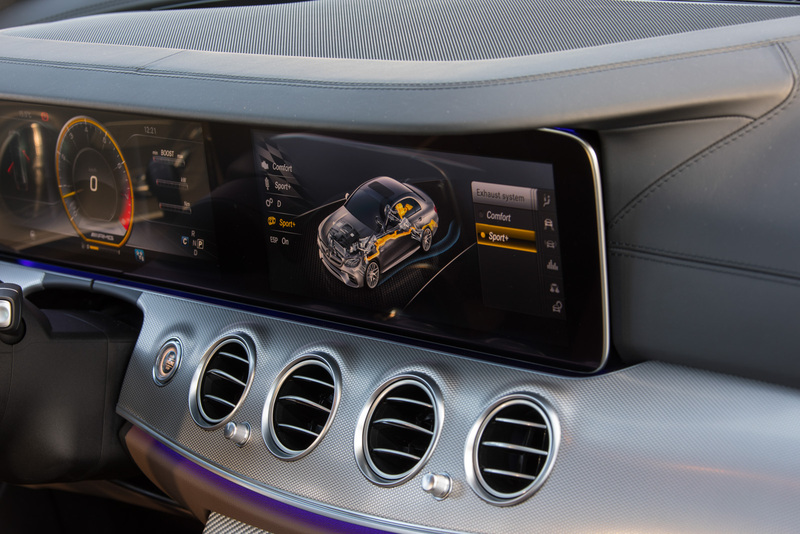 It has been almost a year since I first made acquaintance with the new E-Class, in a dark room somewhere in Mercedes’ center of excellence in Sindelfingen, Germany. 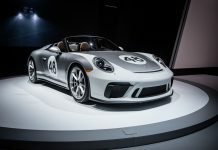 At the ‘design preview’ no cameras were allowed and the car was still heavily disguised, almost ready to make its world debut in Detroit a month later. 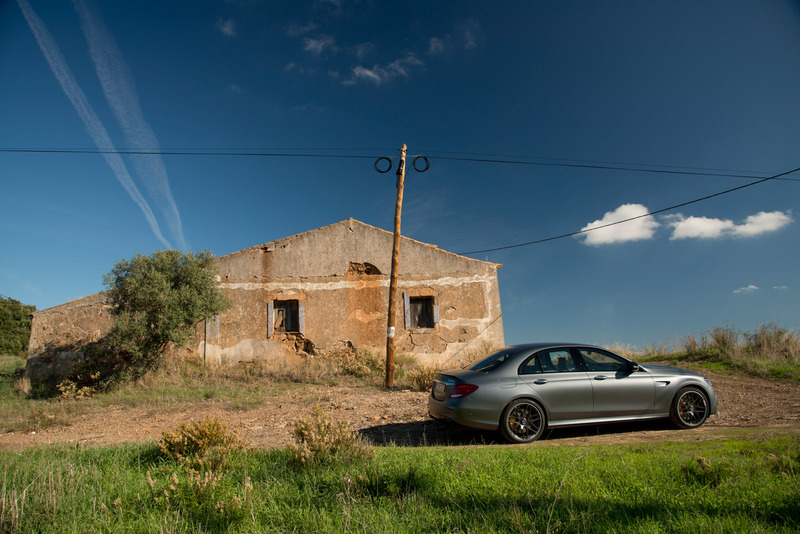 It is here where it all started, my journey intensively following the E-Class to market launch in all its shapes and attitudes. 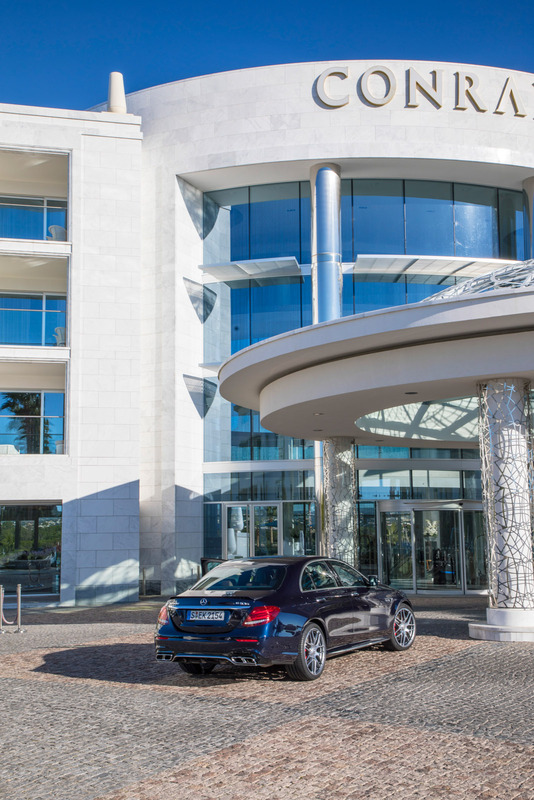 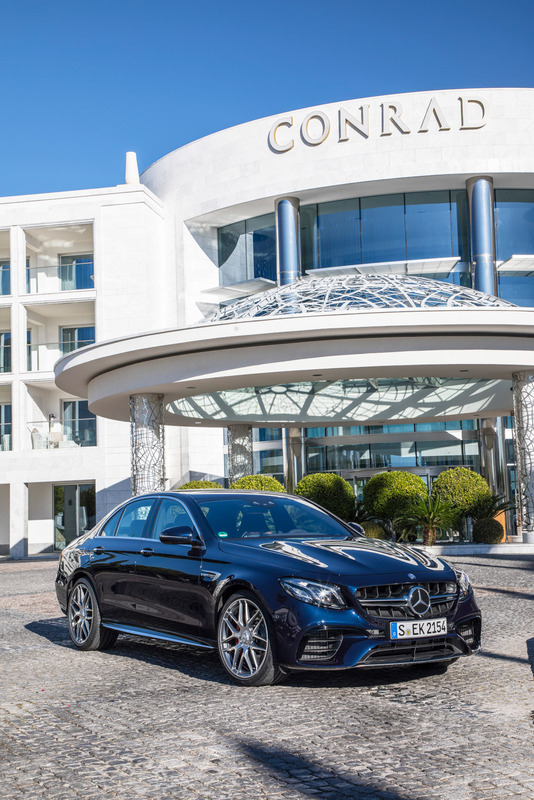 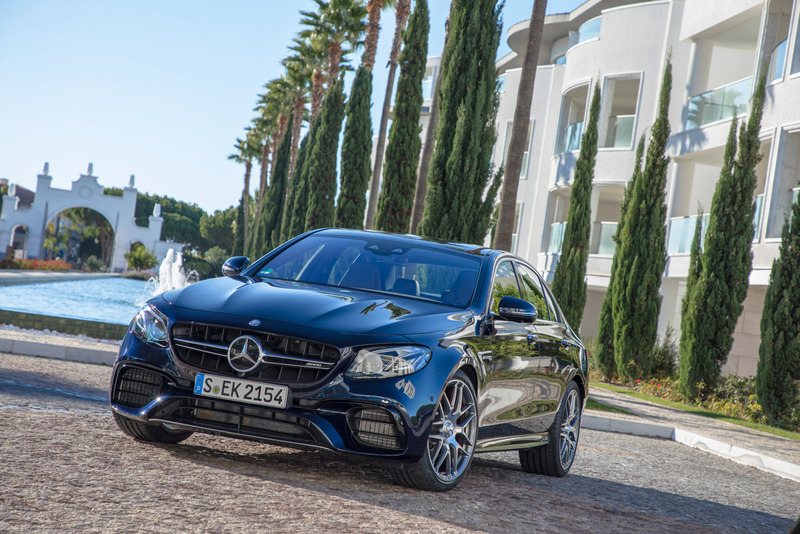 In March I found myself behind the wheel of the brand new E-Class in Portugal, and about half a year later I experienced the estate and E43 models in the North of Germany. 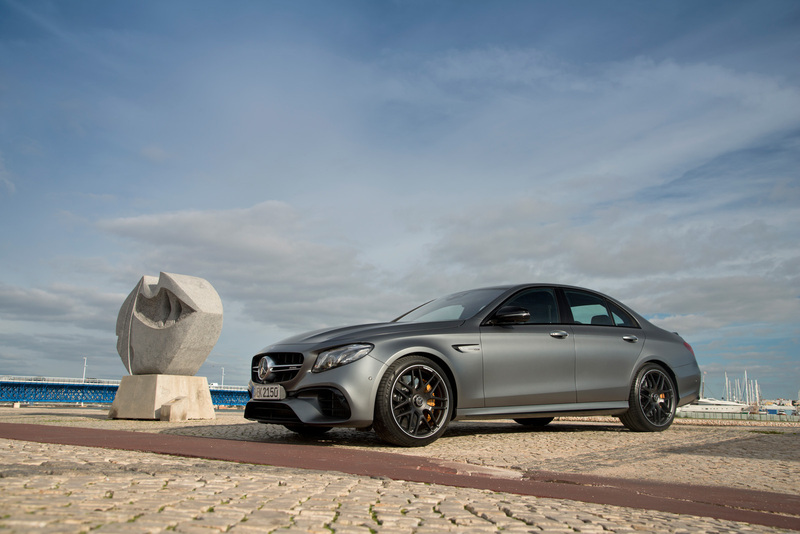 And now we are here, in the most Southern tip of Portugal I find myself standing between two Mercedes-AMG E63 S on the cold and windy long straight of the Portimao racetrack with a 360 degree camera pointed at me. 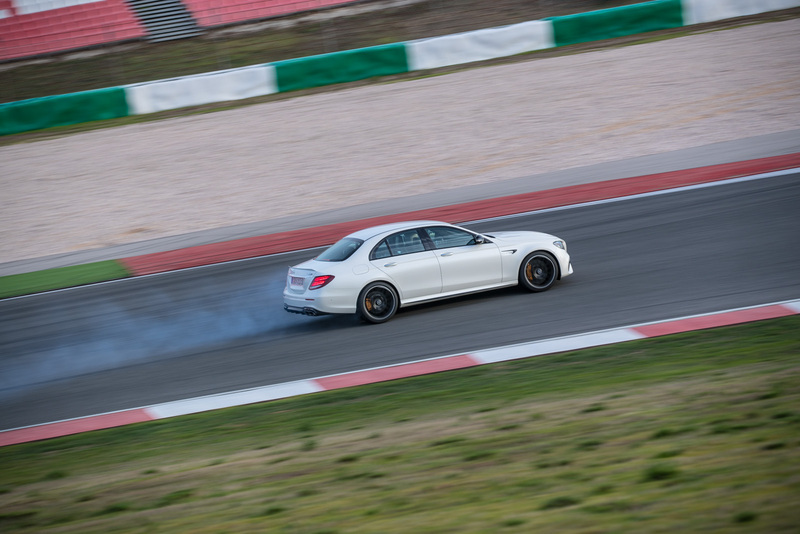 Portimao, or officially ‘Autódromo Internacional do Algarve’, surely must ring a bell. 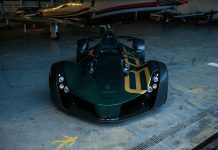 It played a key role in the Grand Tour’s first episode of the season, forming the testing ground for the holy trinity of hypercars. 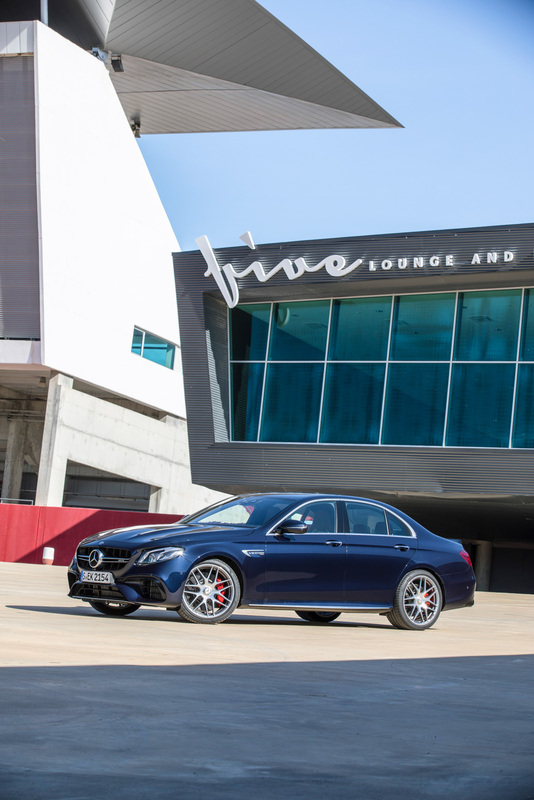 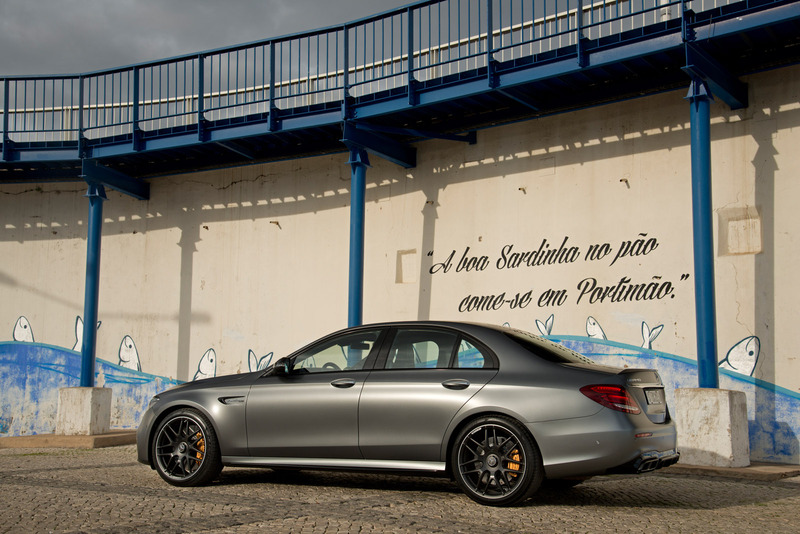 The only eight-year old track with a length of 4,692 kilometers is now the temporary home of the E63 AMG. 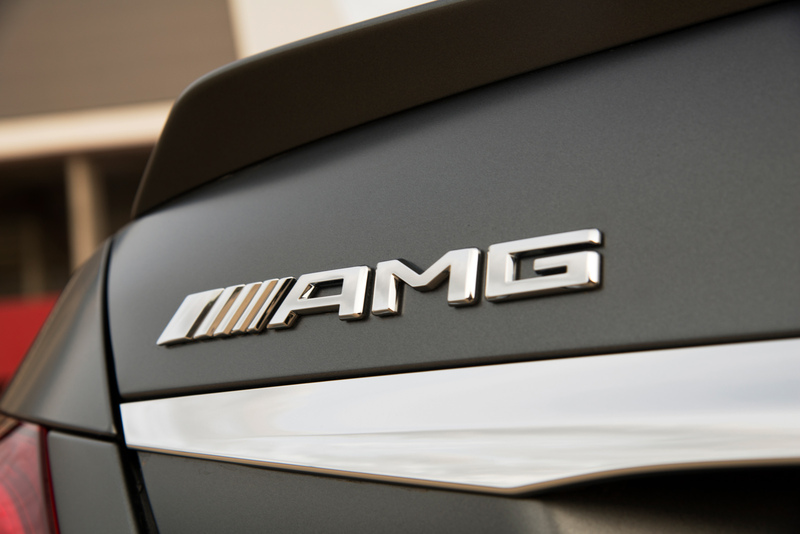 As I first take a detailed look at AMG’s latest creation in the flesh, the so-called sheep clothing is far from evident. 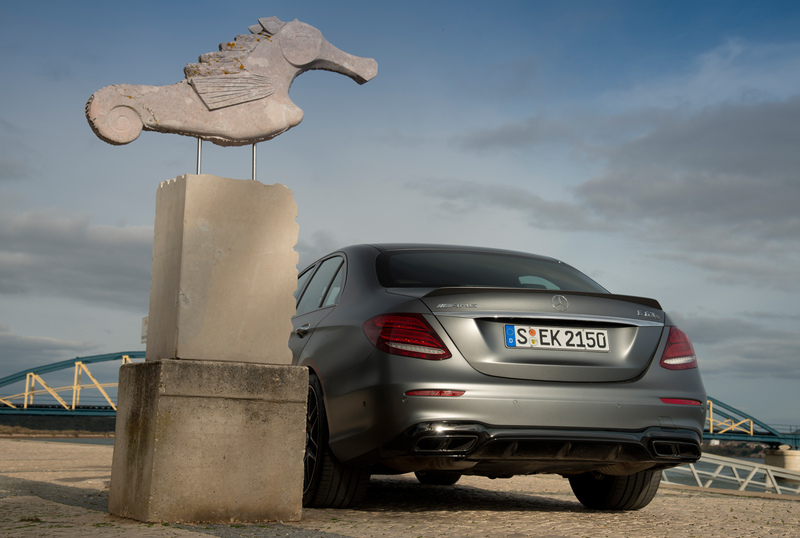 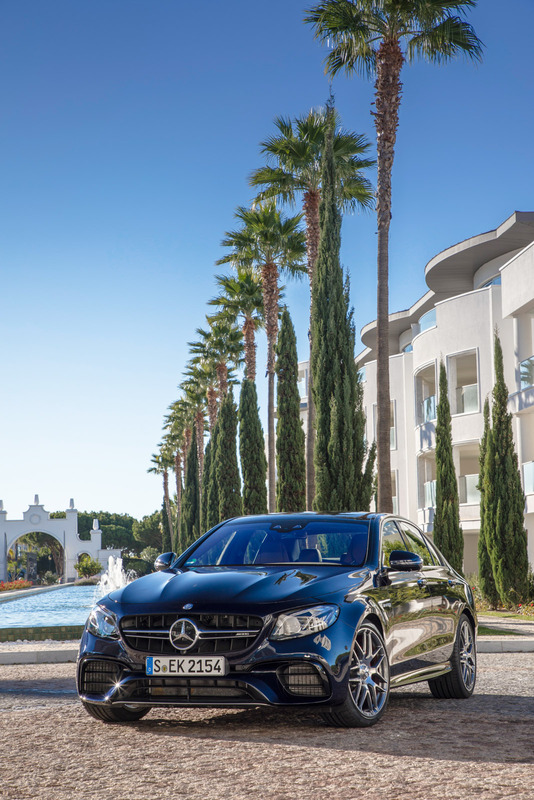 The E-Class’ range topper has a ‘buffed up’ and muscular stance compared to the conventional E-Class models. 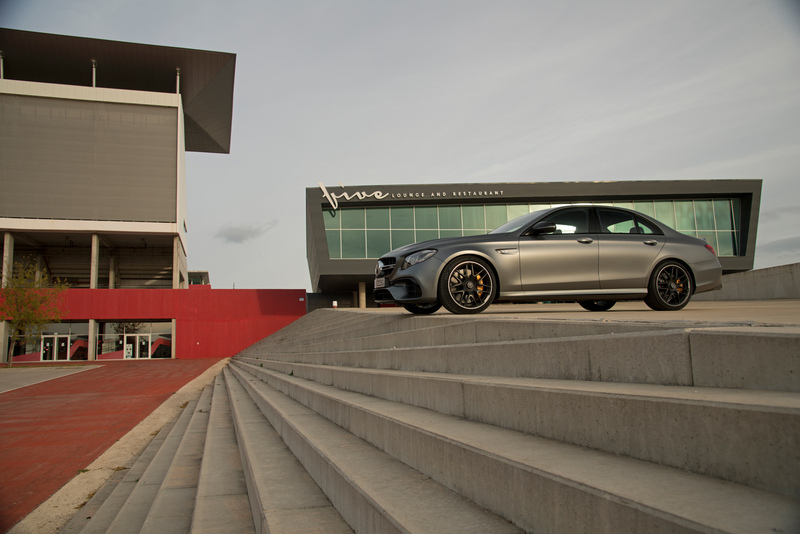 Its sporty character is underlined by a wide and aggressive front apron, courtesy of a completely distinctive design forward of the A-pillar. 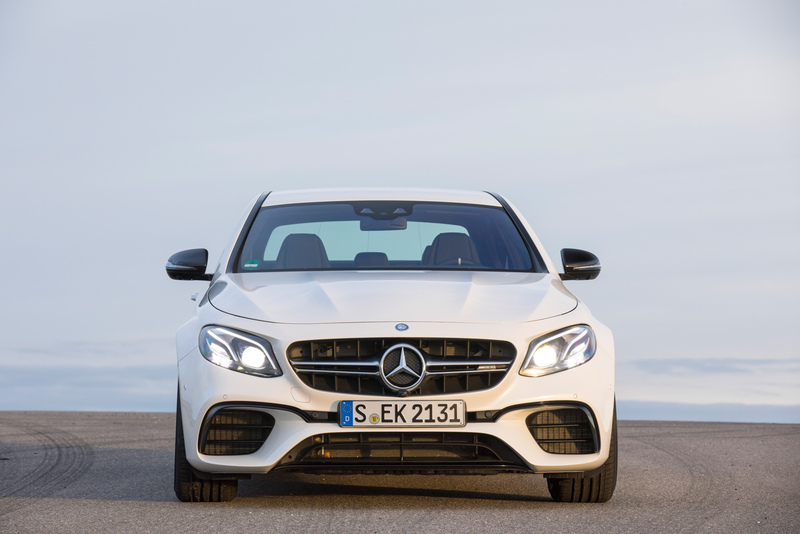 This is the first time the bonnet of an AMG saloon is inset between the bumpers and wings of the car, similar to the front styling of a coupé body. 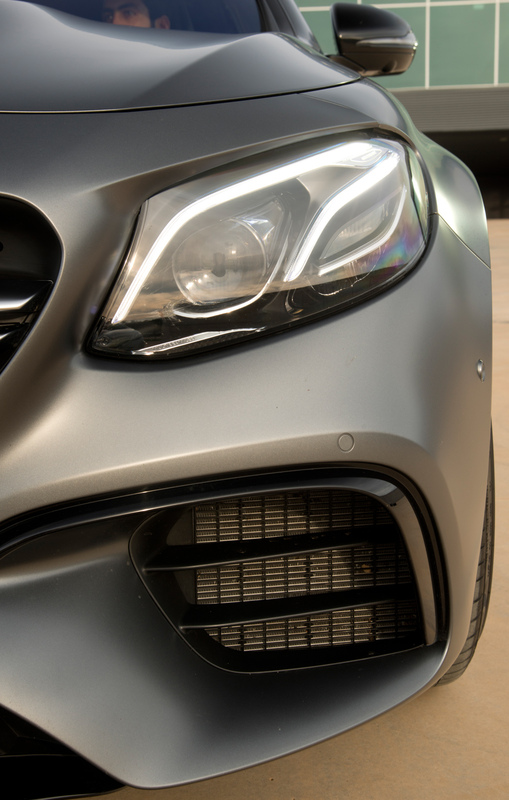 The well visible design lines on top of the bonnet give away the powerhouse underneath, and the wider wheel arches further contribute to the car’s road presence. 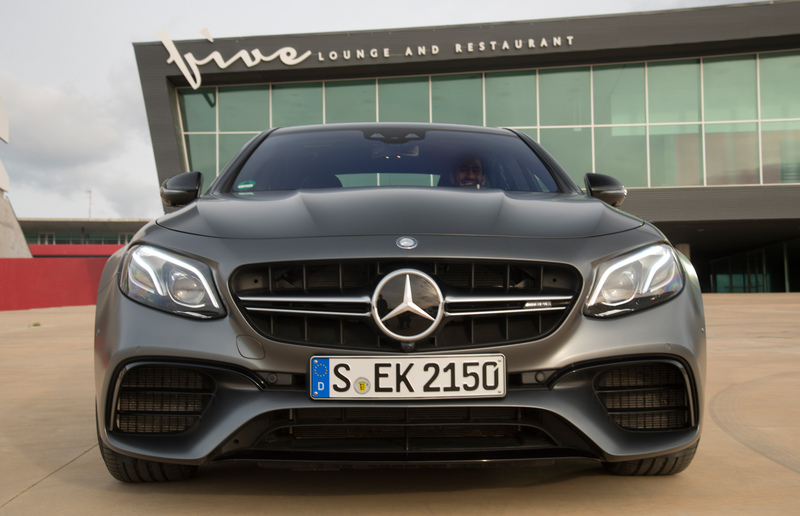 Finally the car’s front is complimented by a brand new radiator grille with new twin-louvers finished in silver chrome. 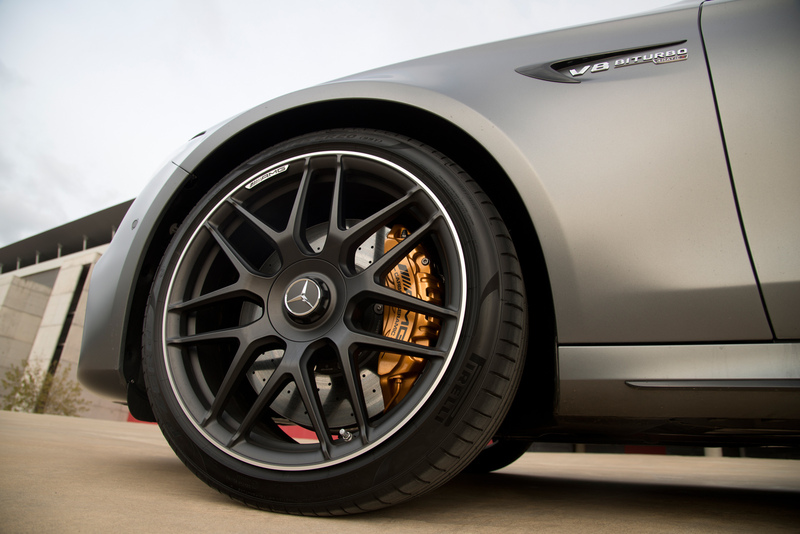 Continuing along the side it is hard to overlook the sharp looking side-skirts, which are optionally finished in gloss black or carbon to match the matt black standard 19-inch multi-spoke AMG wheels. The car’s rear similarly has power and brutality written all over it, with the characteristic squared AMG tailpipes immediately jumping the eye. 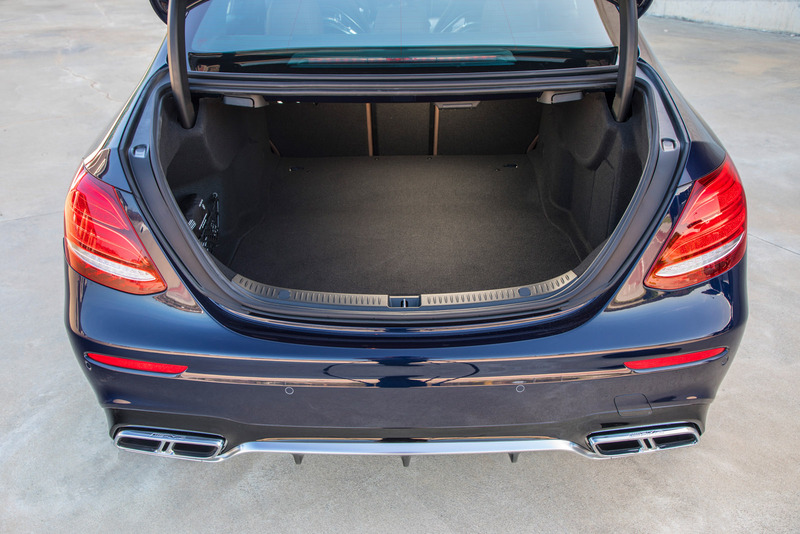 Depending on the trim package, the large diffuser in which they are housed can be finished in gloss black or carbon, just like the tailpipes which wear a silver chrome jacket as standard. 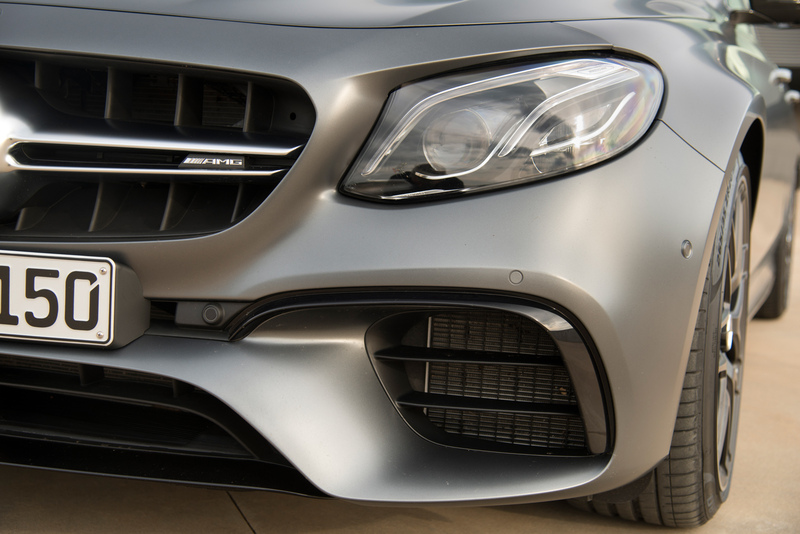 The spoiler lip is finished to match the car’s body paint as standard. 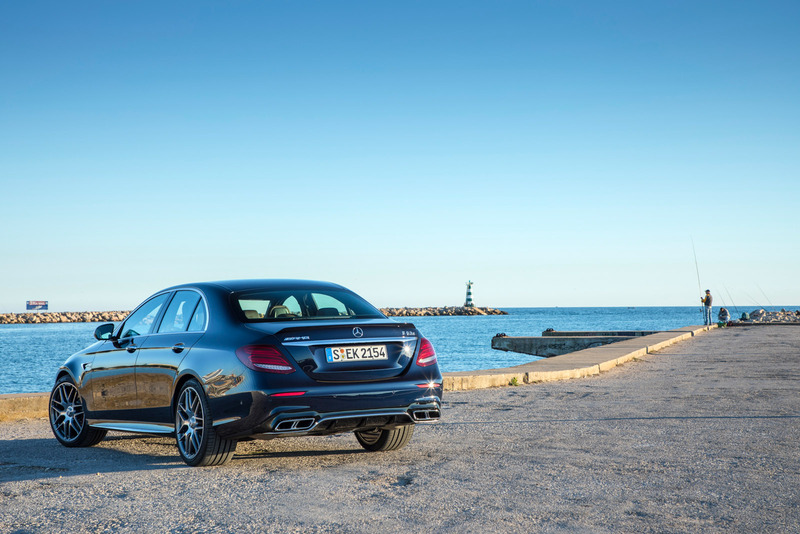 Observing the new Mercedes-AMG E63 S from a distance, it is by all means a very large and muscular car. 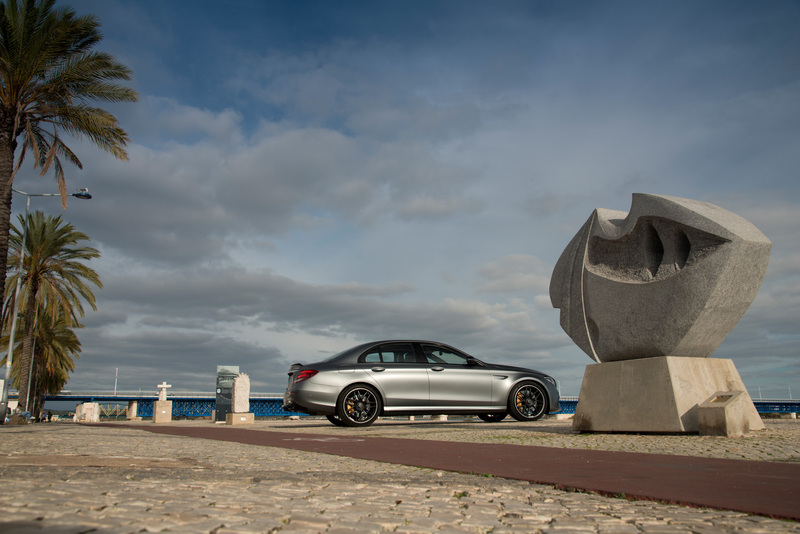 It seems to stand significantly higher on its feet than its siblings, the C63 S and S63 AMG models. 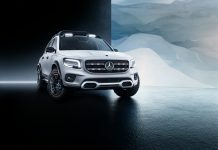 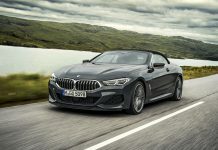 This is the result of putting designers and aerodynamic experts together during the design process, which led the body styling to be combined with performance-oriented lift balance. 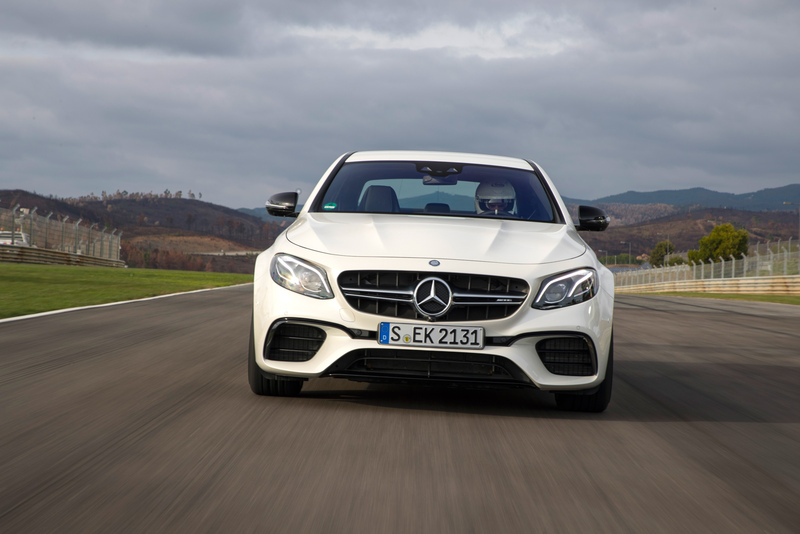 Numerous aerodynamic improvements improve handling characteristics, driving stability on the highway and significantly reduce both wind noise and aerodynamic drag. 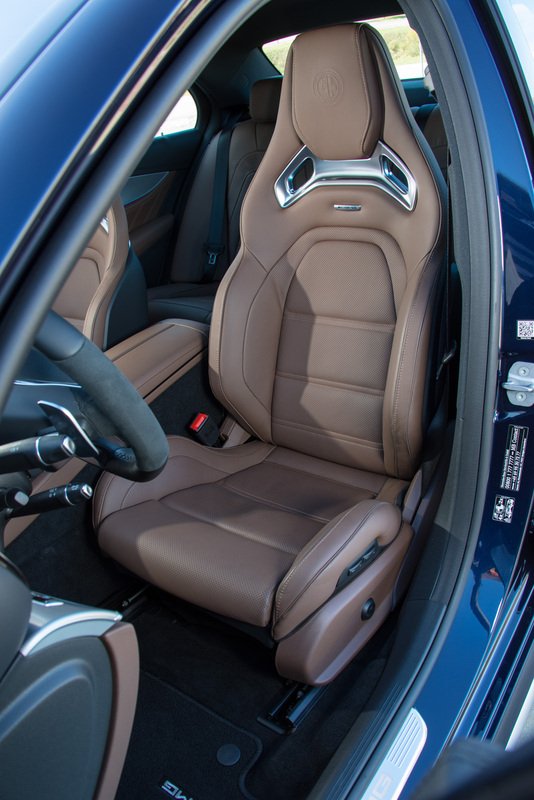 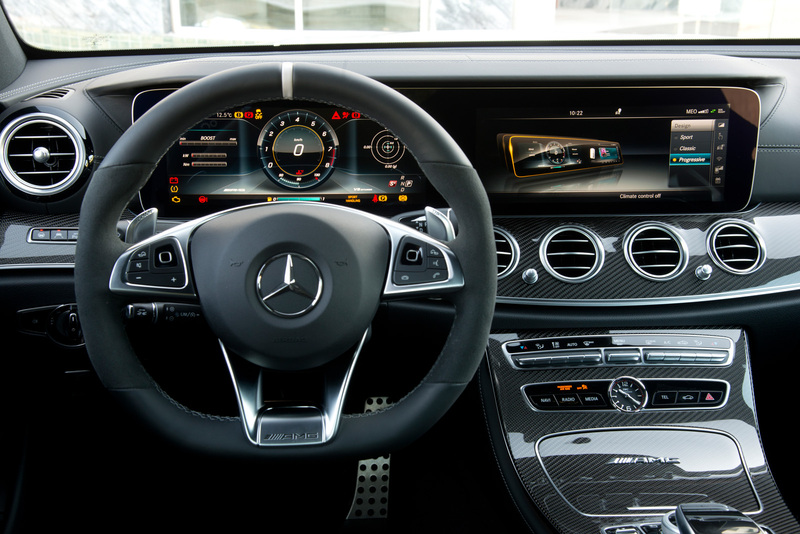 The inside of the car could easily be labeled ‘majestic’, it continuously set the benchmark in its class finding the ultimate balance between luxury, comfort and sportiness. 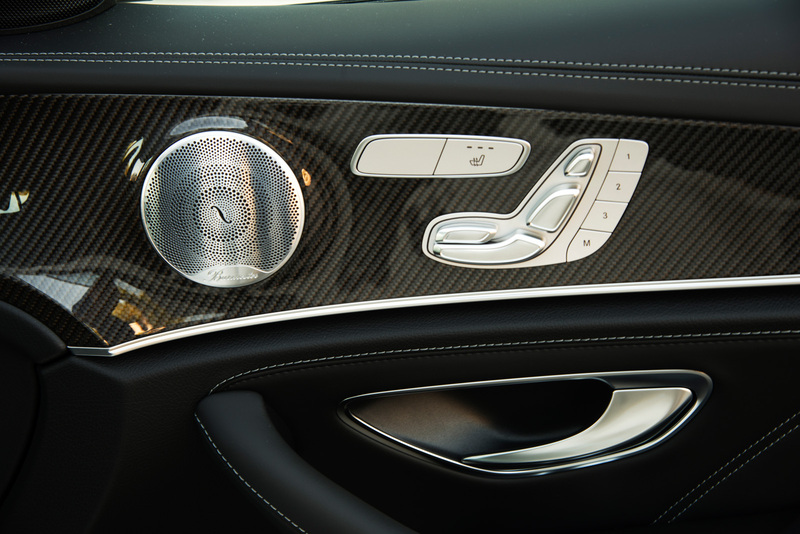 The large mid-console forms a nice extension to the interactive dashboard, both finished with the highest quality materials, from gloss carbon fiber to a variety of veneer inserts. 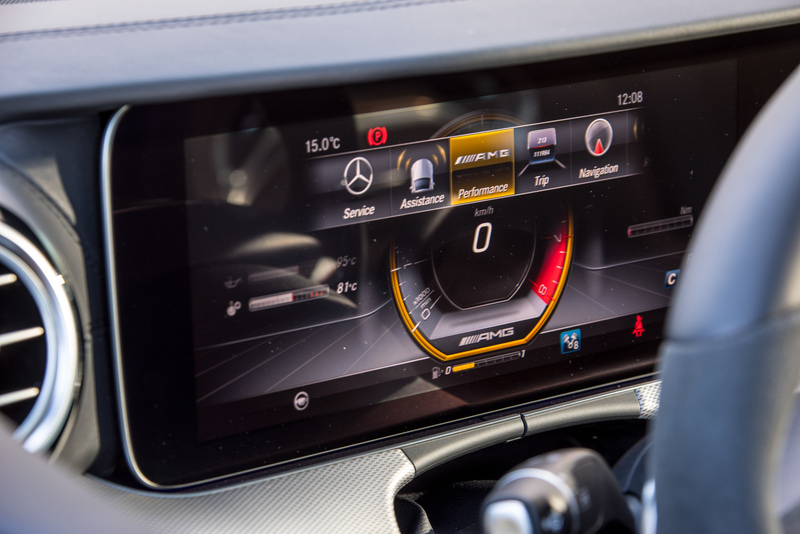 The optional dual-screen setup with handsome glass cover is simply a pleasure to work with, and the car’s infotainment setup now gets a few extra integrated functions that come with the additional performance. 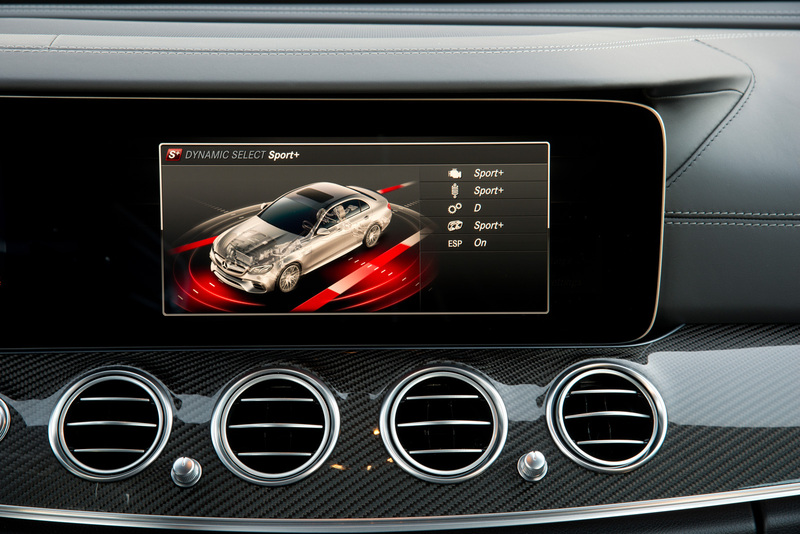 One of those is the AMG-styled digital instruments, which joins the traditional, sport and modern options. 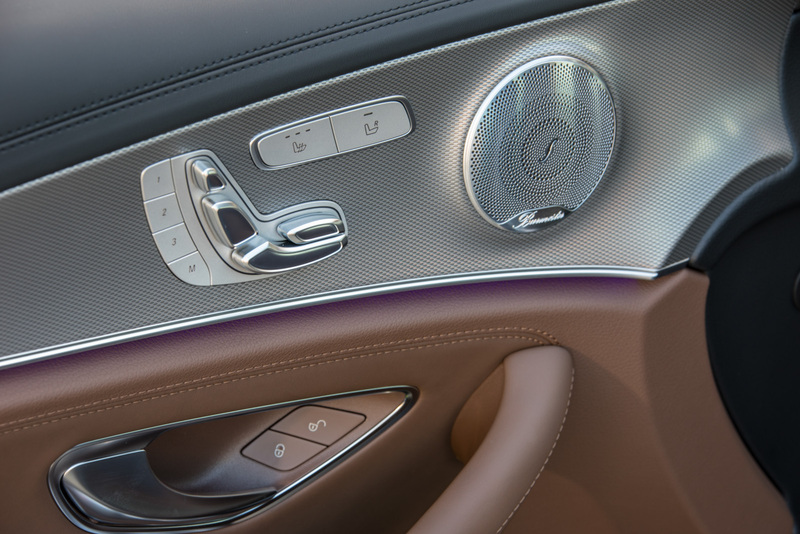 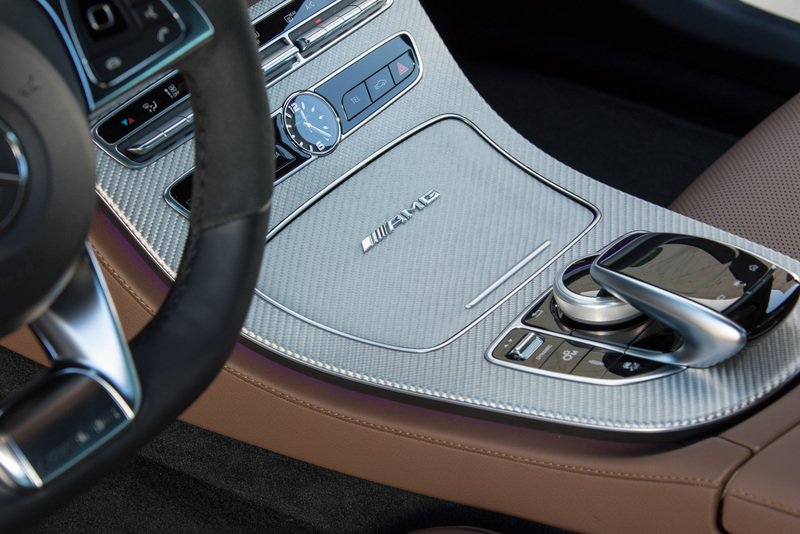 Other highlights of the brand new E-Class interior are the 3D Burmester surround sound system, 64-color ambient lighting scheme and fully electric sport seats. 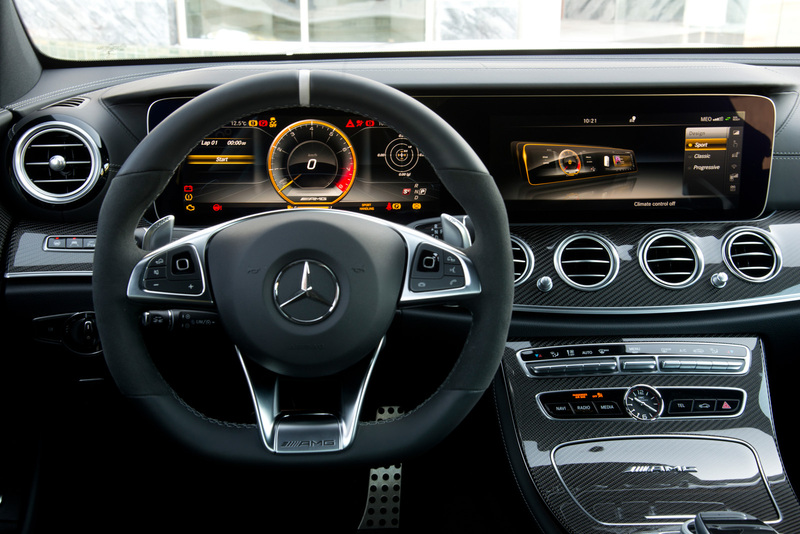 For a detailed overview of all the interior specs please make sure to read my earlier design preview. 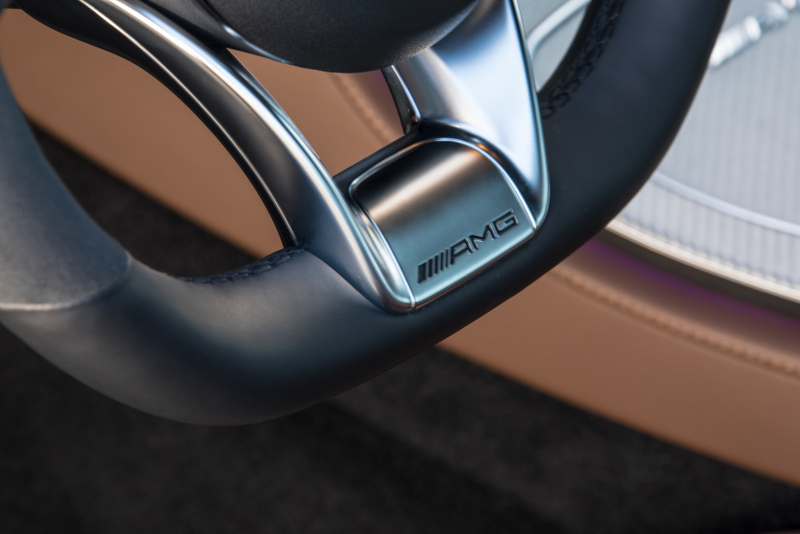 Taking a seat behind the AMG sports steering wheel and once again taking in the top of the bill interior, it almost feel strange once you realize an interior of this caliber is tied to performance figures that make your eyes blink twice. 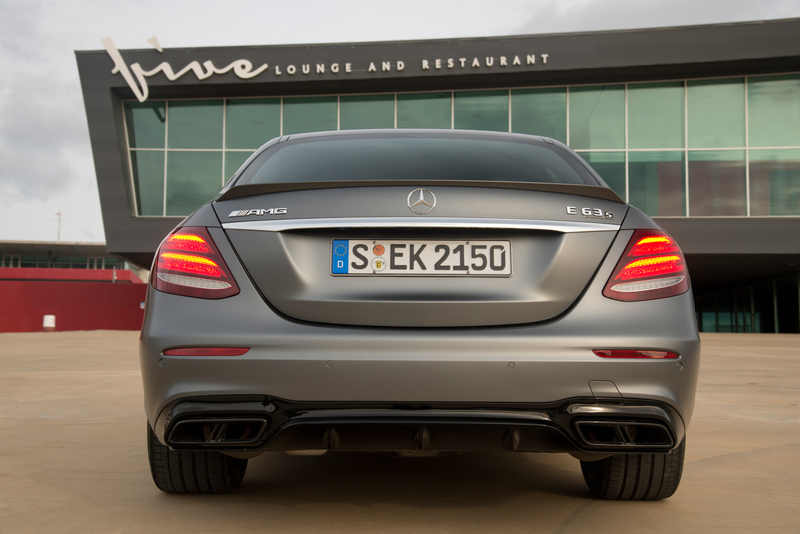 Because make no mistake, this is the most powerful E-Class of all time. 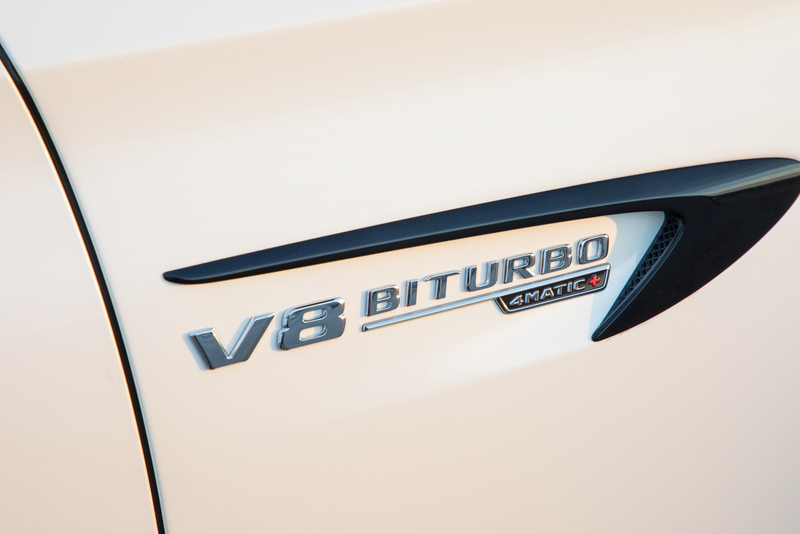 At the push of a button the angry V8 Biturbo – which has been significantly taken under hands – comes to life with a firm growl. 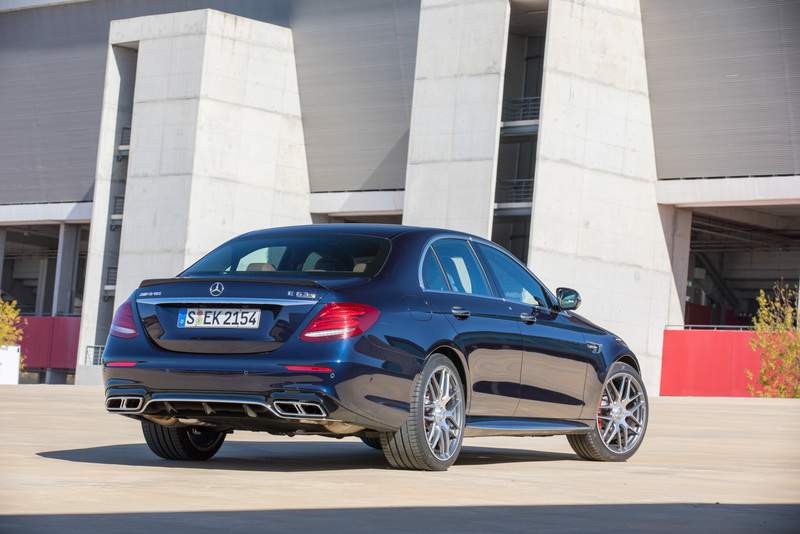 Inside the cylinder banks now sit two twin-scroll turbochargers that are more responsive and further boost performance. 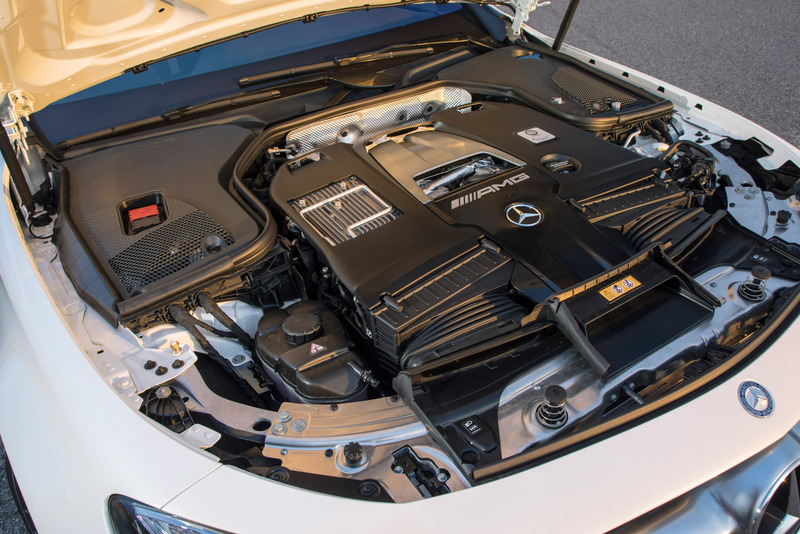 The ‘hot inner V’ setup also saves space and the favorable placement of both turbochargers further optimize airflow and thus lower CO2 emissions. 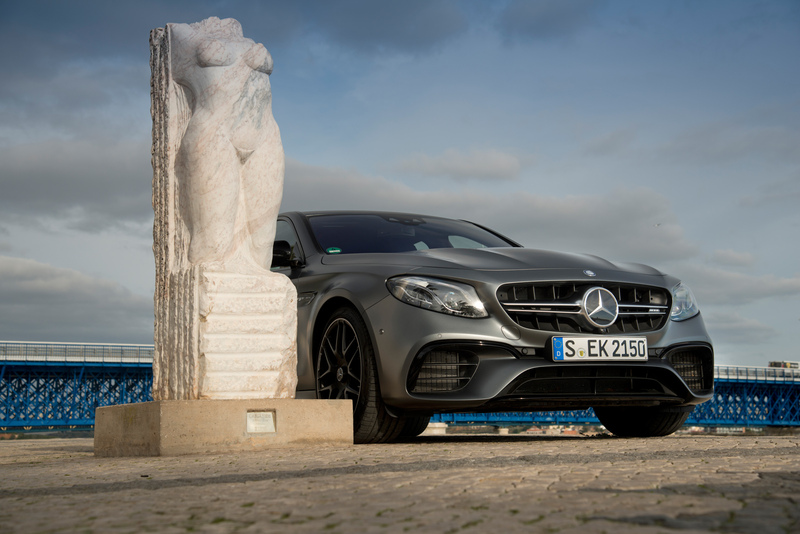 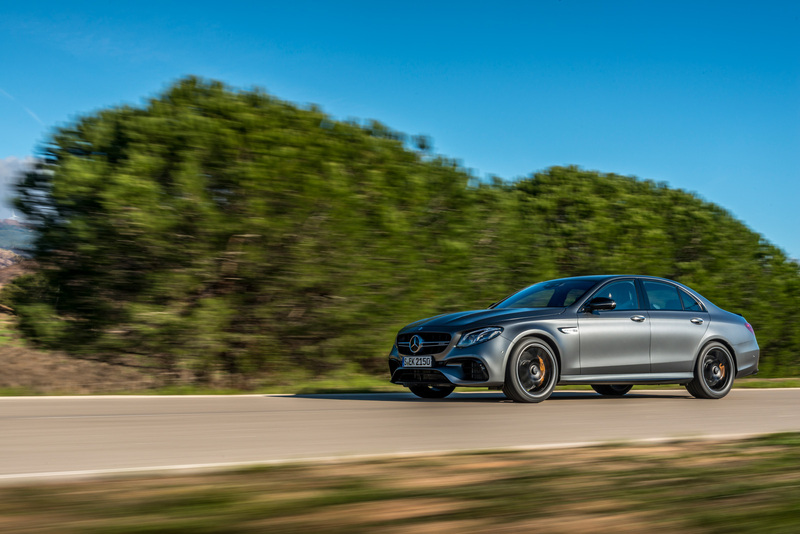 As a result, the 4.0-liter V8 Biturbo in the E63 S now produces 612 hp (450 kW) and 850 Nm of torque at its peak between the 2,500 and 4,500 rpm range. 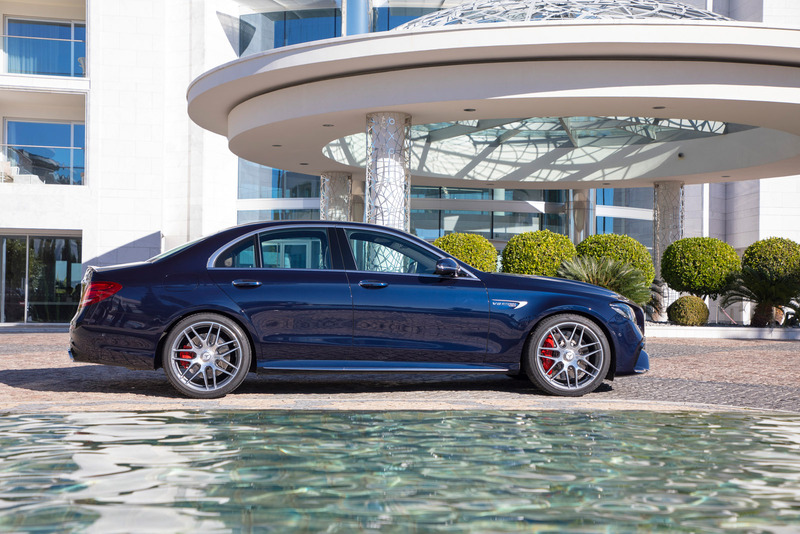 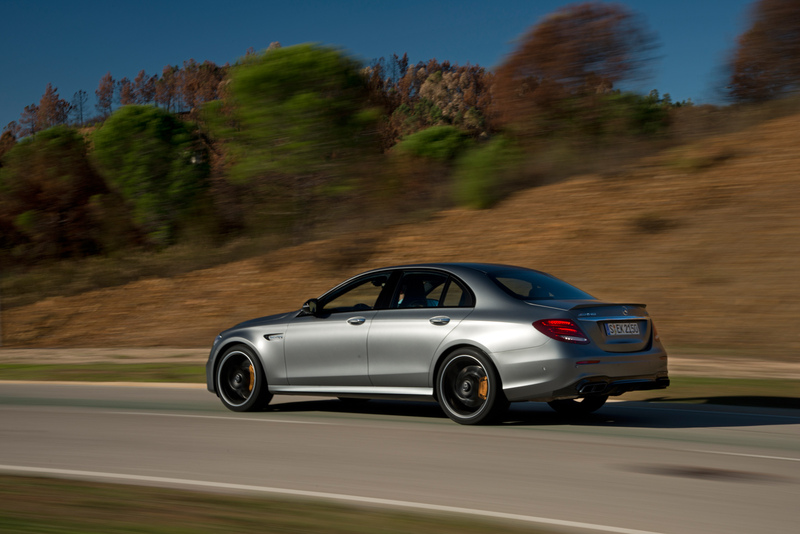 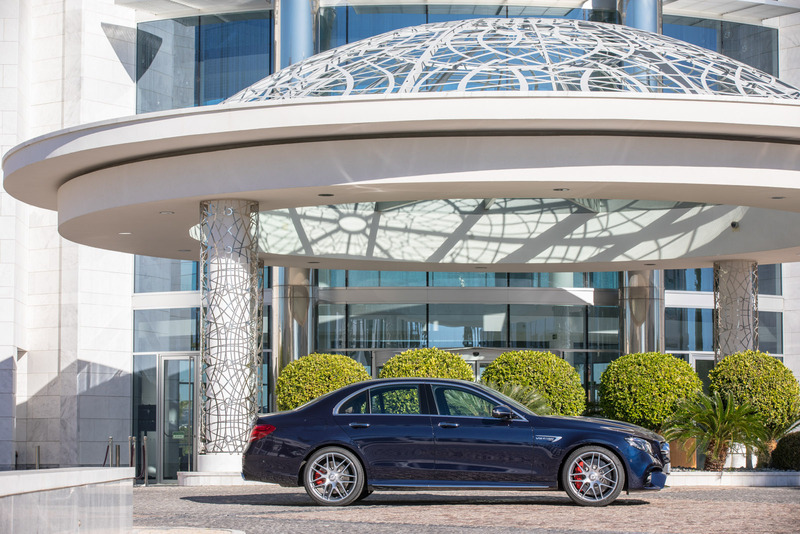 The ‘conventional’ E63 produces 571 hp (420 kW) and 750 Nm of torque. 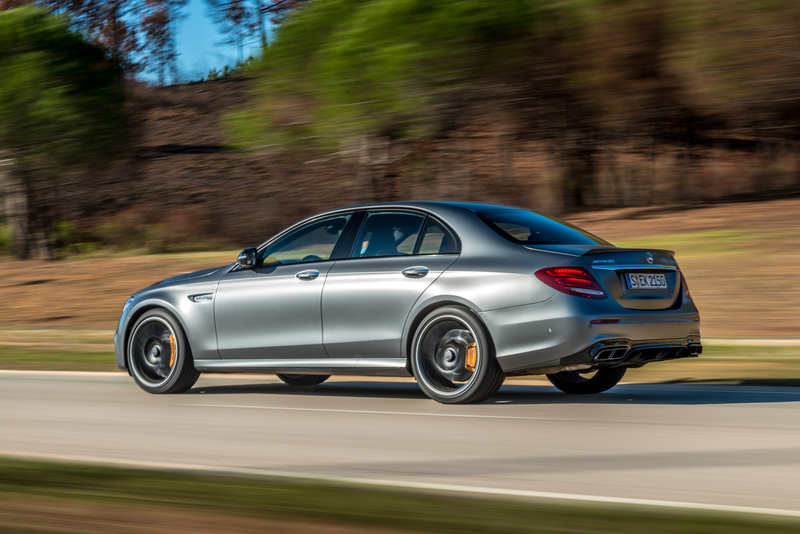 To put things into comparison, the 2015 E63 S liberates 585 hp and 720 Nm of torque from its 5.5-liter V8 Biturbo engine. 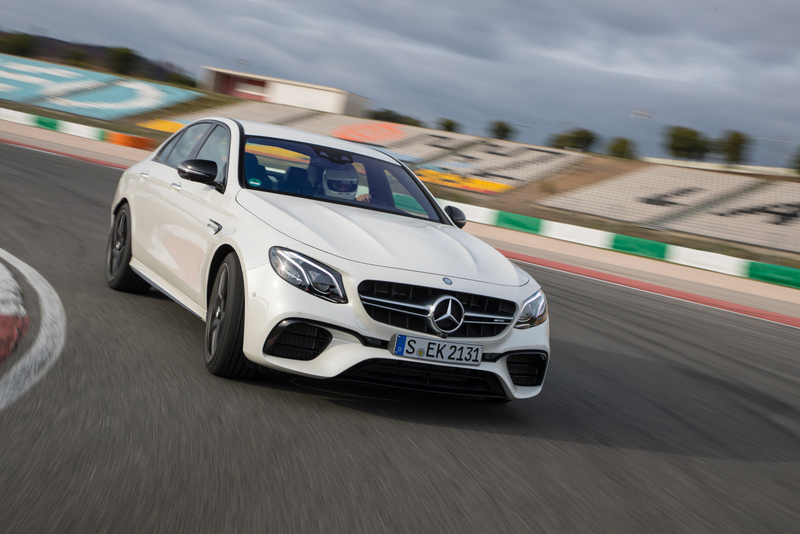 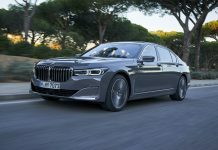 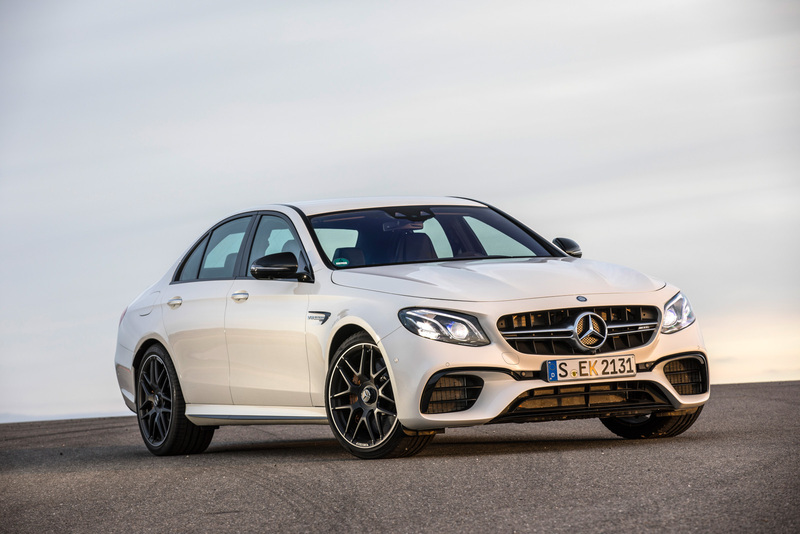 A new milestone has been reached breaking through the 600 hp barrier in the business saloon class, something that was bound to happen as the competition recently surpassed the 600 hp mark as well. 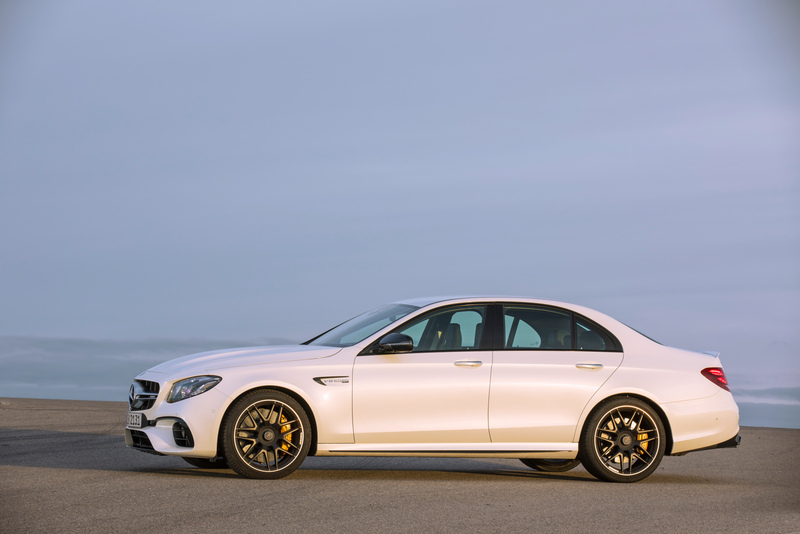 The new E63 S now also sets the performance benchmark in its class, and it takes only 3.4 seconds for the swift saloon to reach a 100 km/h from a standstill. 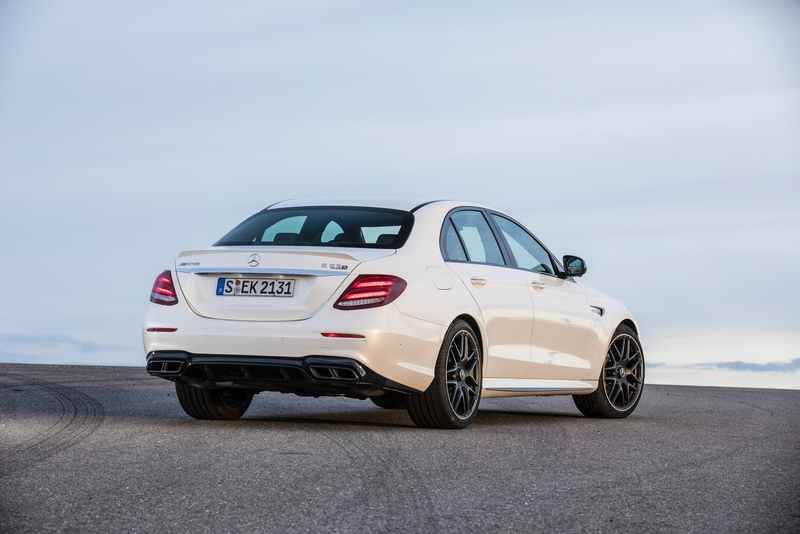 The normal E63 does it in a mere 3.5 seconds, courtesy of both the reworked engine and standard 4MATIC+ all-wheel drive system. 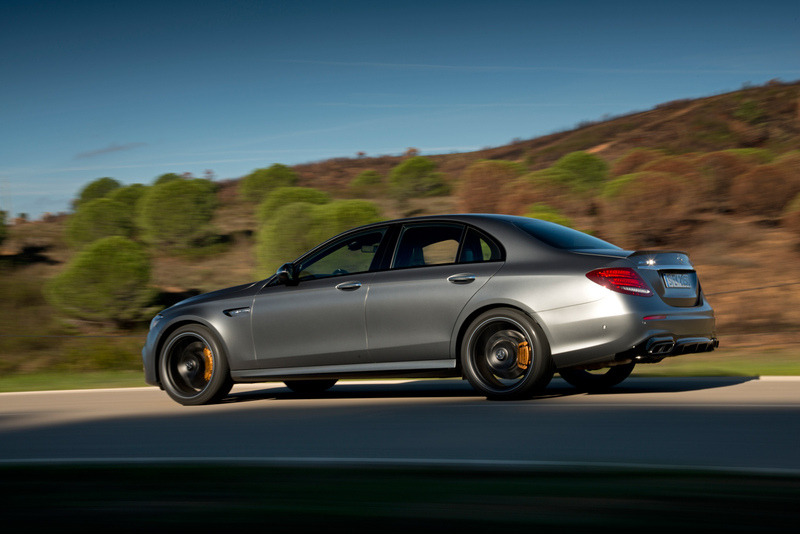 AWD was first introduced on the previous generation E63, and for good reason. 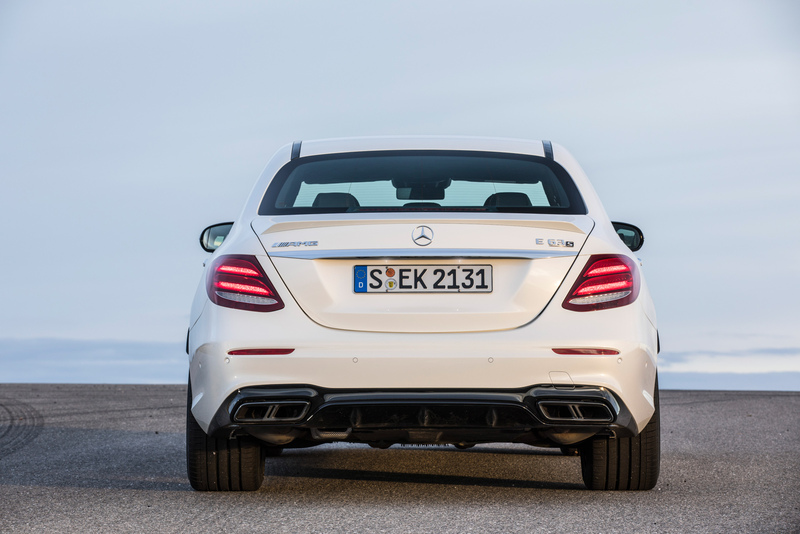 With this amount of power it would simply be highly irresponsible to have it all diverted to the rear wheels only. 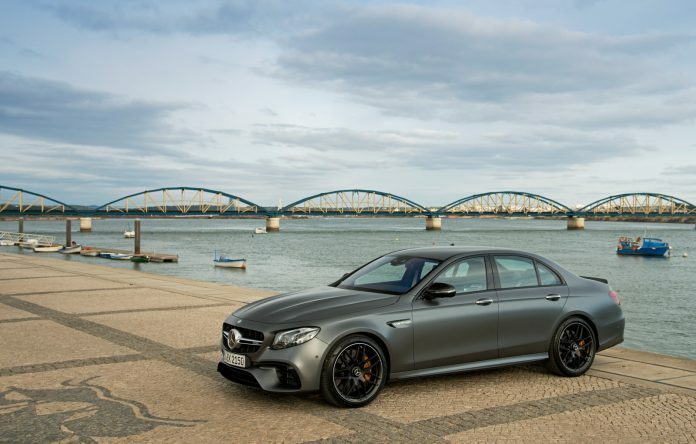 However, if you are capable of keeping the E63’s brute force in place, ‘drift mode’ is an option that can be engaged by putting the DYNAMIC SELECT button into ‘race mode’, shutting off the ESP and putting the gearbox in manual. 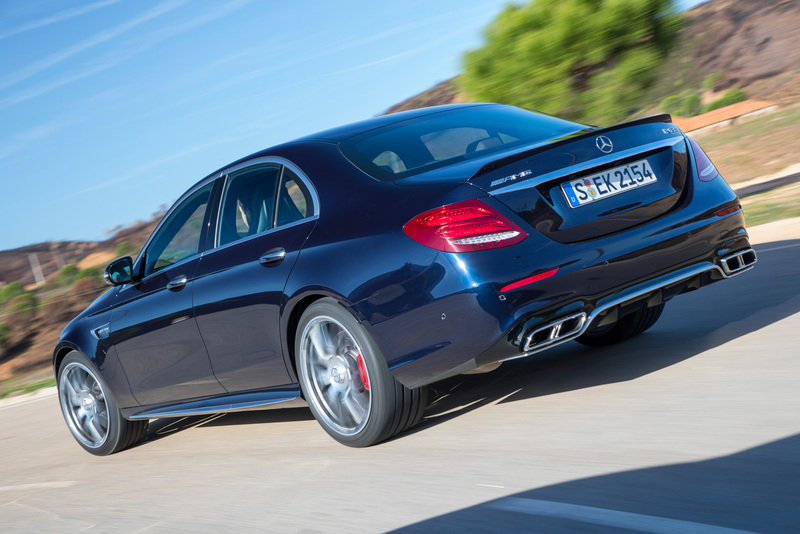 All that is left is holding both shifting paddles behind the steering wheel and your E63 is now fully powered through the rear wheels. 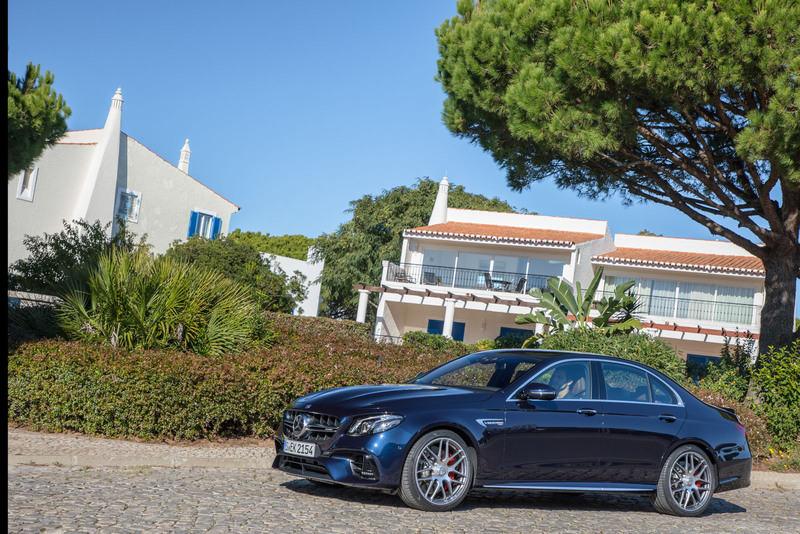 With the rain starting to drizzle down in the otherwise mostly sunny Algarve, I keep things on the safe side and let the 4MATIC+ system guide me. 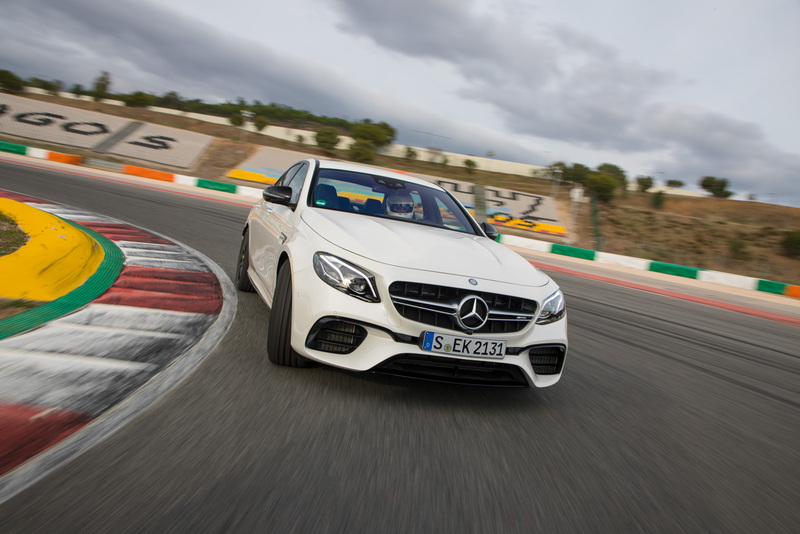 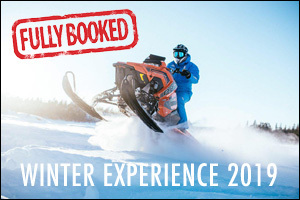 The ‘+’ stands for that it now comes with variable torque vectoring, applying power to each of the four wheels individually where it is needed most to get the best traction possible. 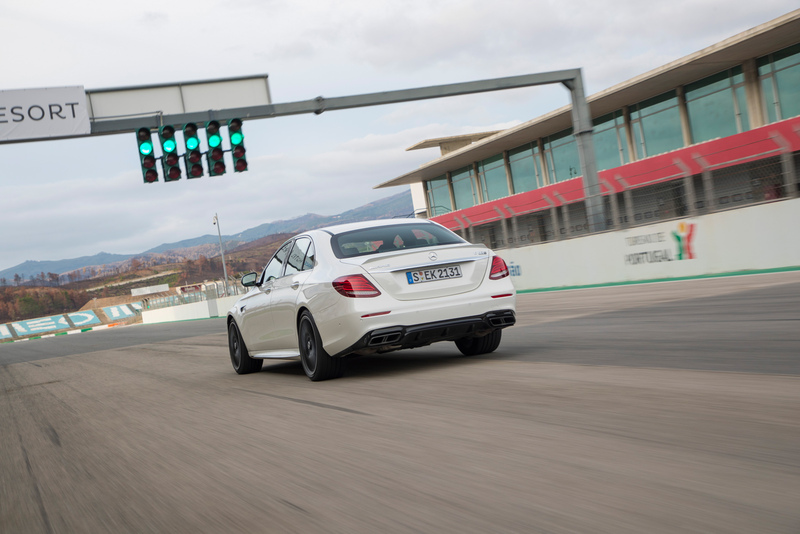 As I exit the pitlane following ‘Mr. 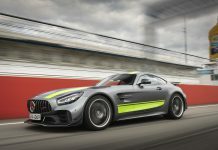 DTM’ – DTM record holder Bernd Schneider – in the AMG GT S pace-car I see the variable torque distribution system being put to work immediately on the second screen. 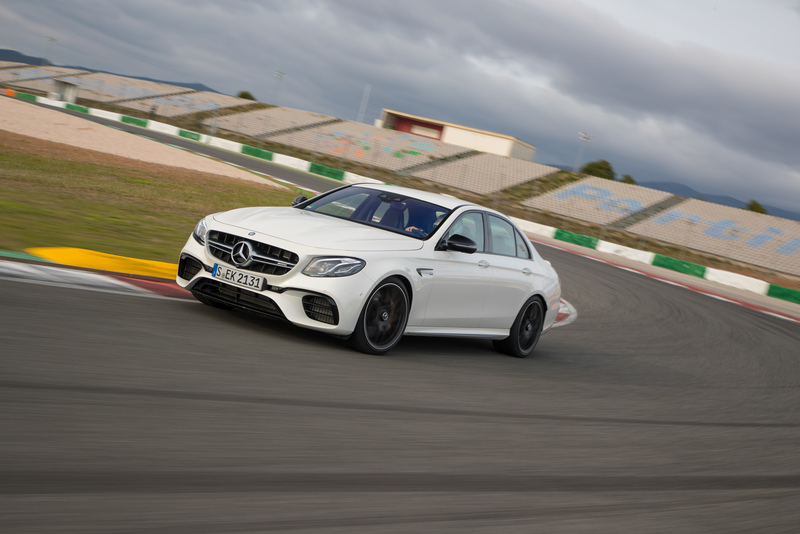 The Portimao track is by all means a challenging one, originally designed for the MotoGP. 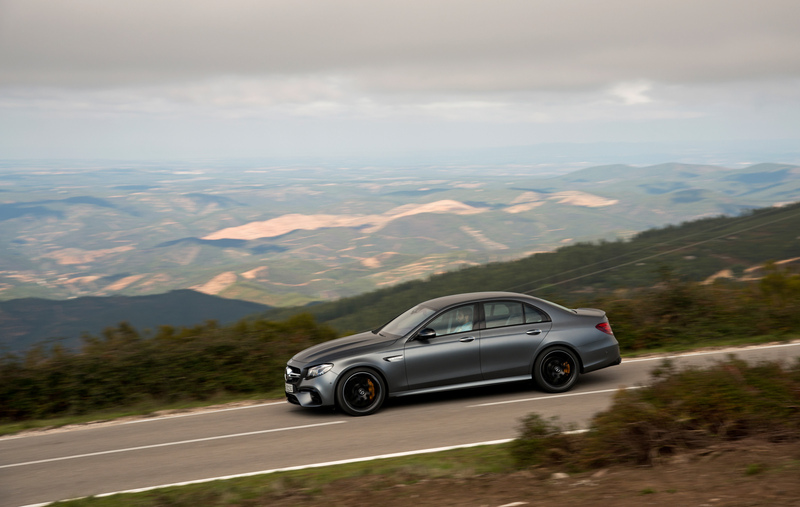 It knows many altitude differences and sharp turns that proved even more challenging once buckets of rain came down on us. 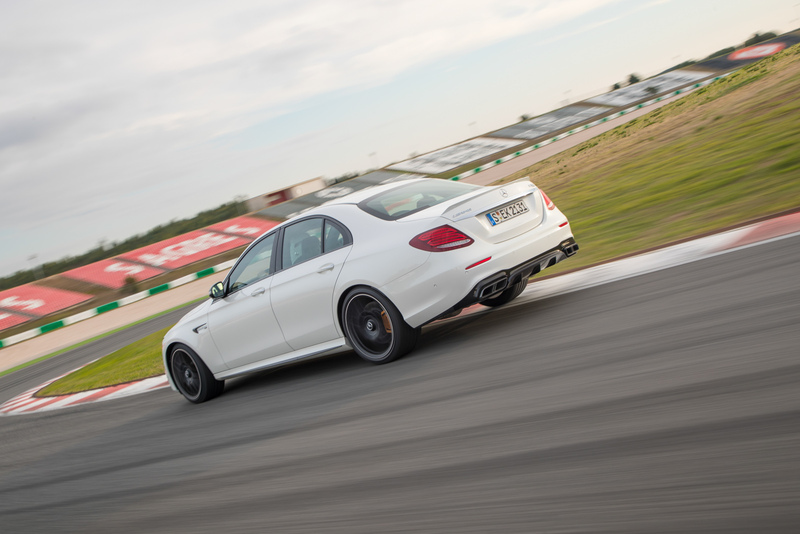 Having left the first few turns behind me it becomes clear that the car brings along a good chunk of weight. The 4MATIC+ system kept the E63 well in place however, making sure the car had plenty of traction to fiercely accelerate out of every corner. 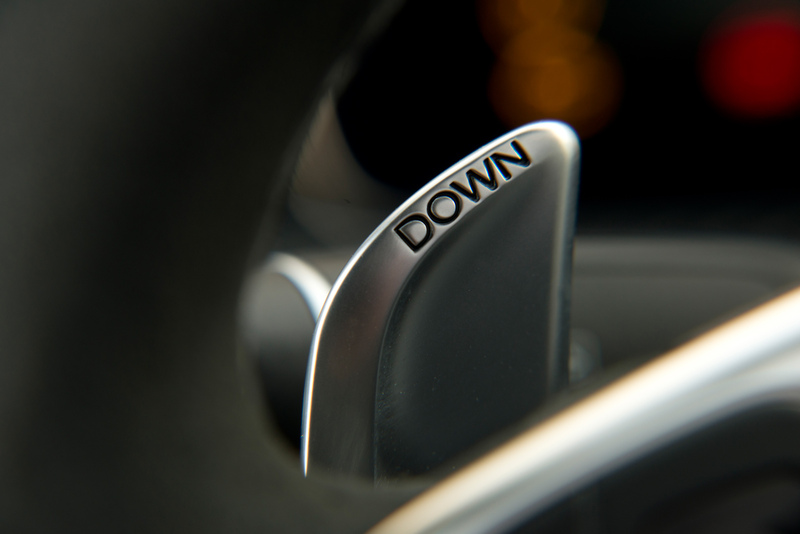 I however remained wary of the confidence the AWD system provided me with, after all, this amount of torque together with a wet surface forms a dangerous cocktail. 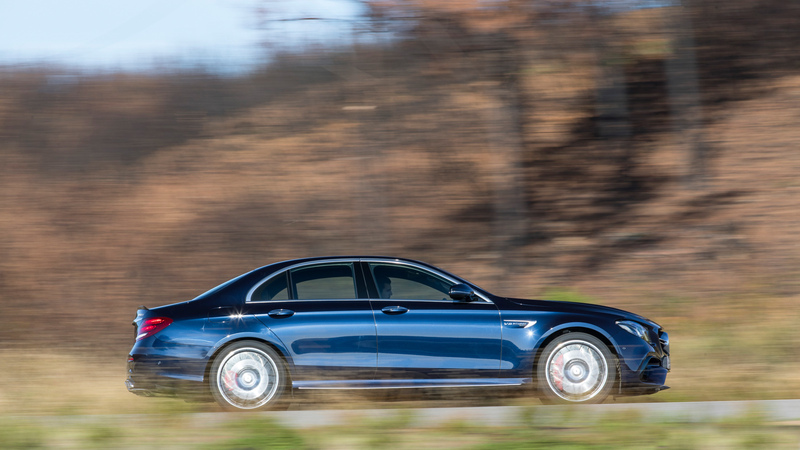 The electro mechanical speed-sensitive sports steering felt very solid too, in sport plus it is configured nicely and heavy and it responds very well. 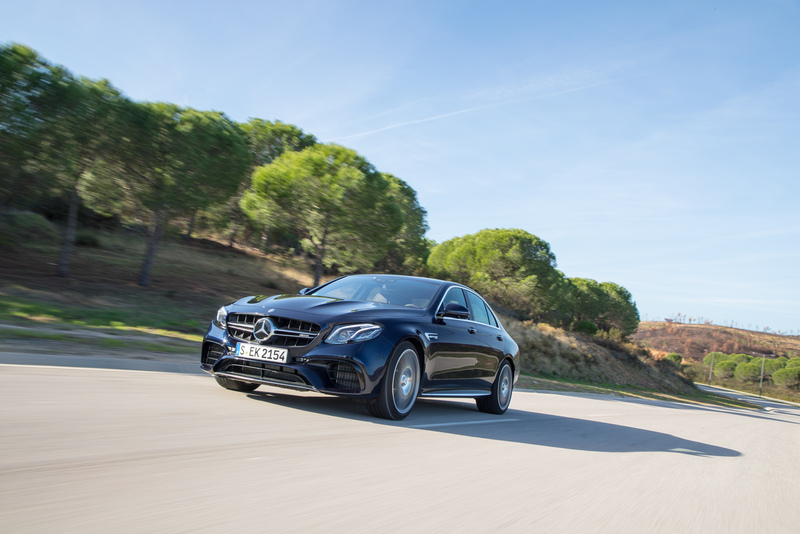 Despite the great traction and plenty of feedback from the steering wheel, taking the E63 out of its comfort zone was not much of a challenge. 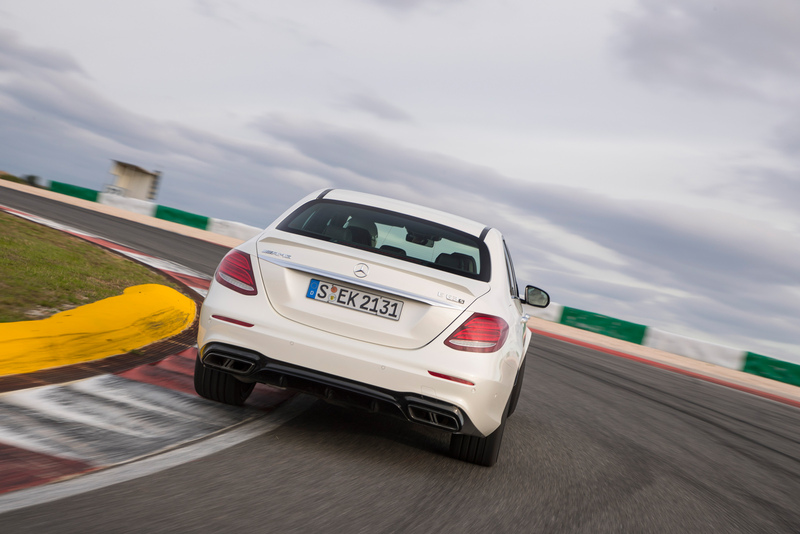 The abundance of torque and the weight factor made it complicated to suppress understeer at times. 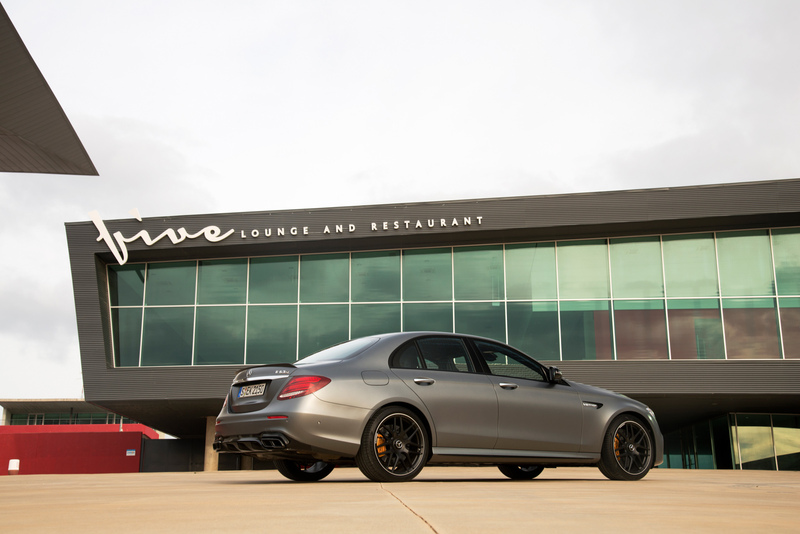 This is also where the notorious fun factor comes in, making the rear dance and see how it at times attempts to transfer all of its 612 horses onto the asphalt is part of the charm the E63 embodies and the connection with the driver it so anxiously maintained throughout the years. 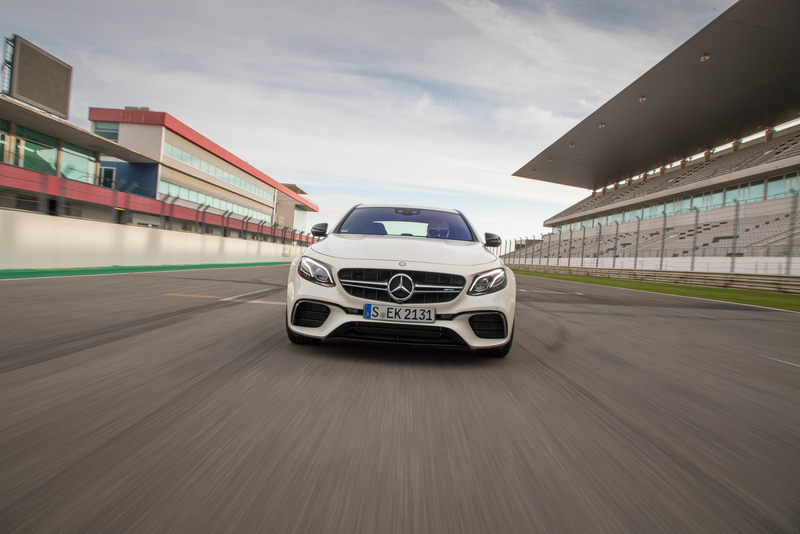 On the straight I managed to hit an effortless 250 km/h, which normally is where the limiter kicks in unless you ticked the AMG driver package off the option list. 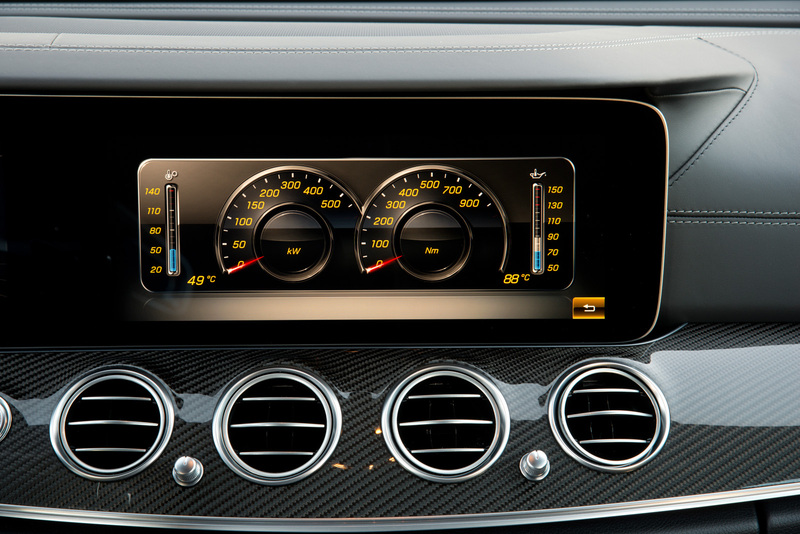 In that case the limiter is set at 300 km/h. 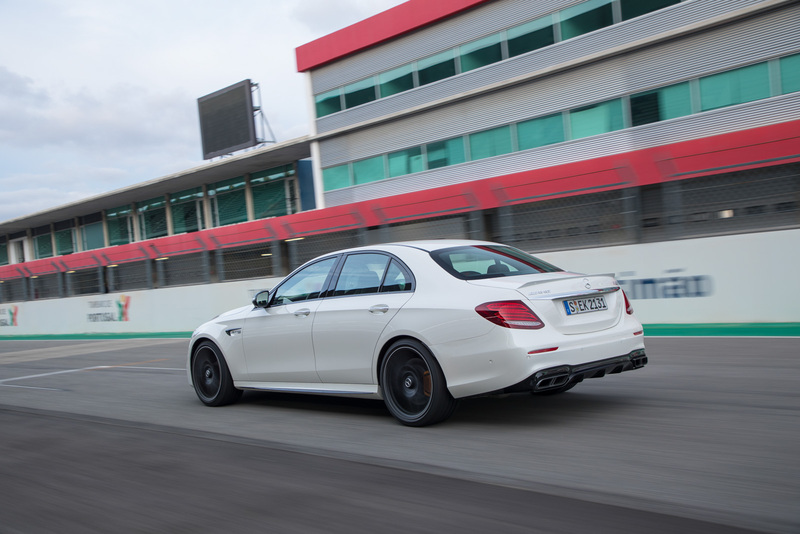 In a straight line is where the E63 easily excels, coming out of the last turn before the straight the integrated wet clutch together with the AWD system provide a smooth and quick acceleration with the speedometer still clicking up in tens beyond 100 km/h – 105, 115, 125 and on. 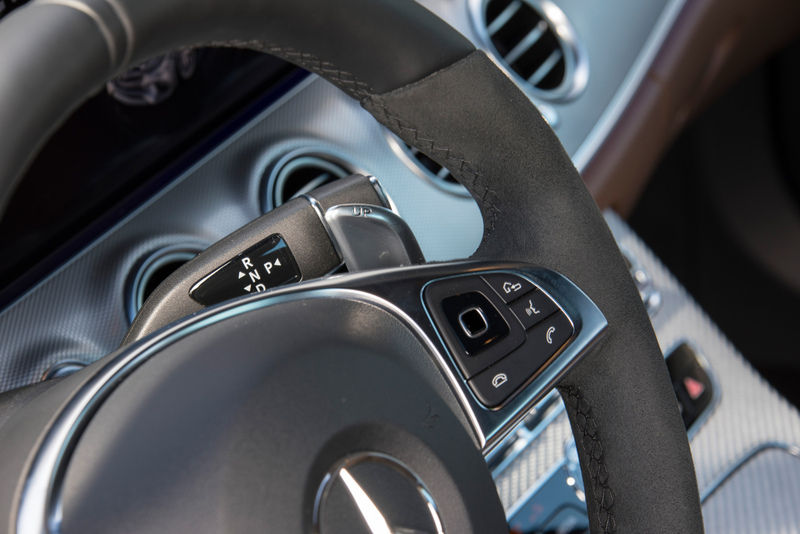 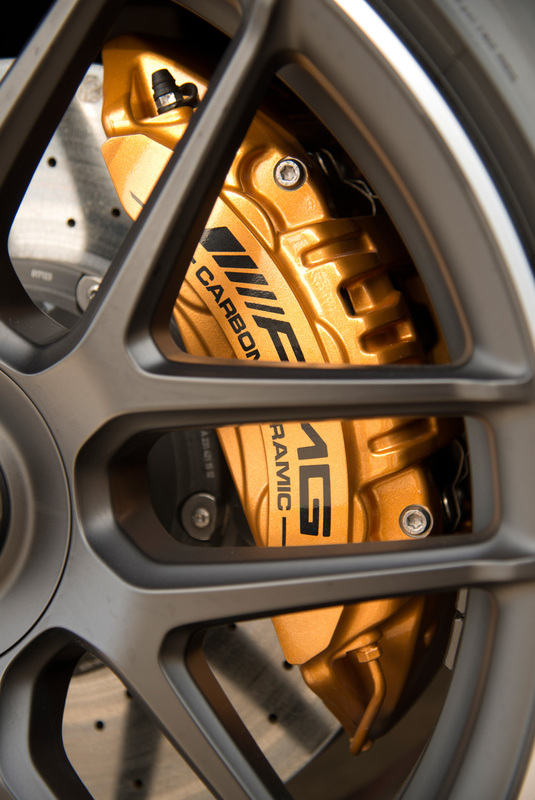 The accompanying gear shifts of the AMG SPEEDSHIFT MCT nine-speed transmission are fast and spot on. Moving on to the road, I was set to take the Mercedes-AMG E63 S for a spin around the area that is home to some breathtaking country roads. 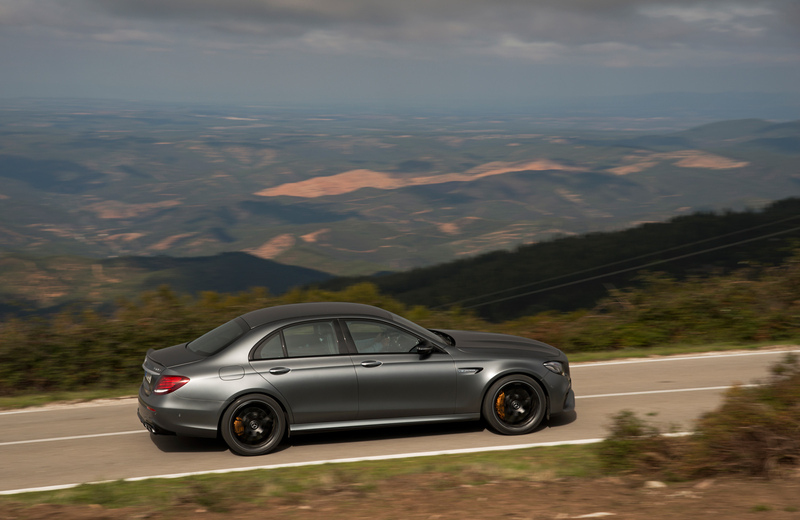 I however quickly let go of the idealistic picture that I had in mind after watching the Grand Tour’s first episode and focused on the best the car has to offer. 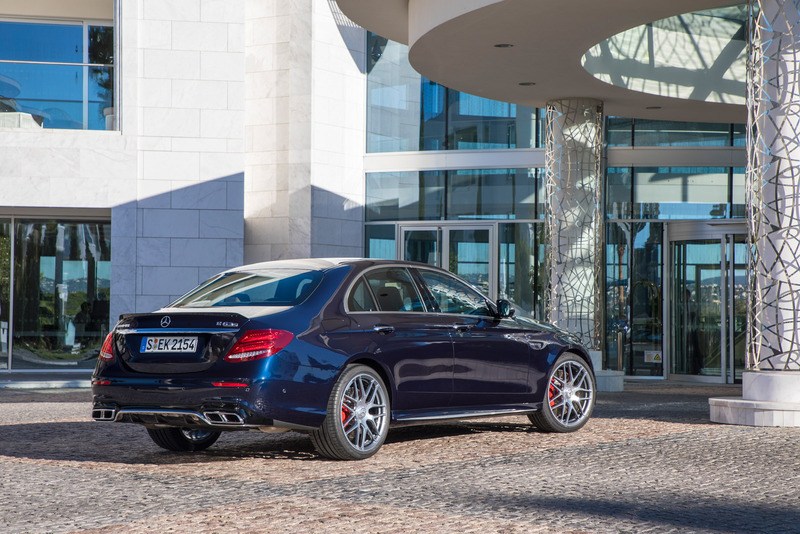 Efficiency plays a key role in the new E63 S, introducing the AMG cylinder management system for the first time in conjunction with the V8 Biturbo. 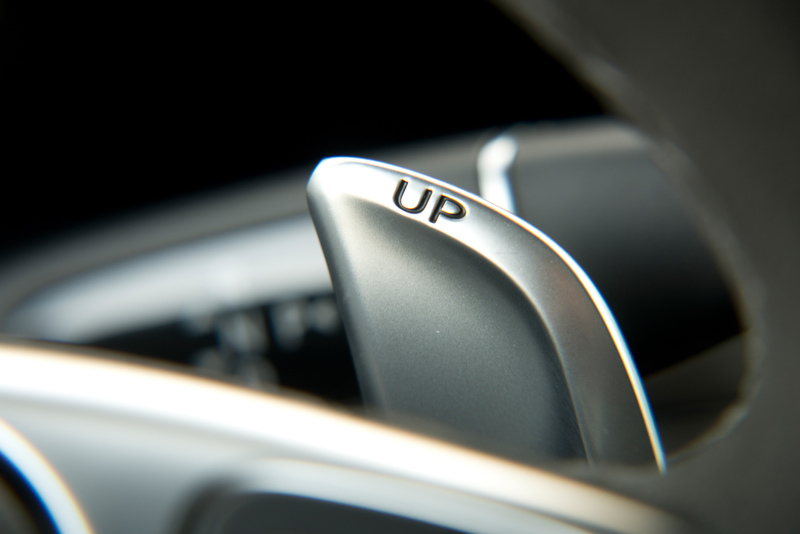 The cylinder deactivation system is engaged once you switch to comfort mode via the DYNAMIC SELECT menu between the 1,000 and 3,250 rpm range. 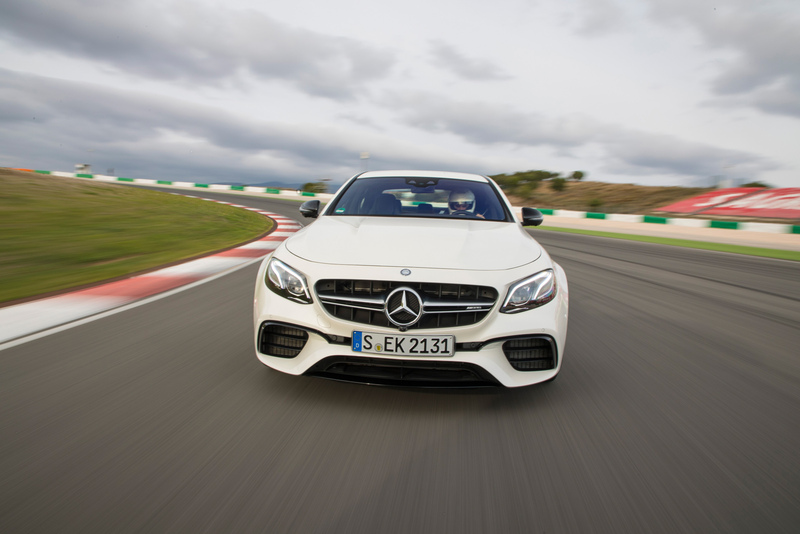 Without notice the four troublemakers in the eight-cylinder ensemble are put in their cage as the rest of the team takes over in a more quiet and relaxed manner. 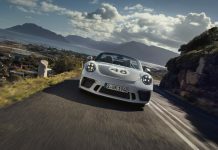 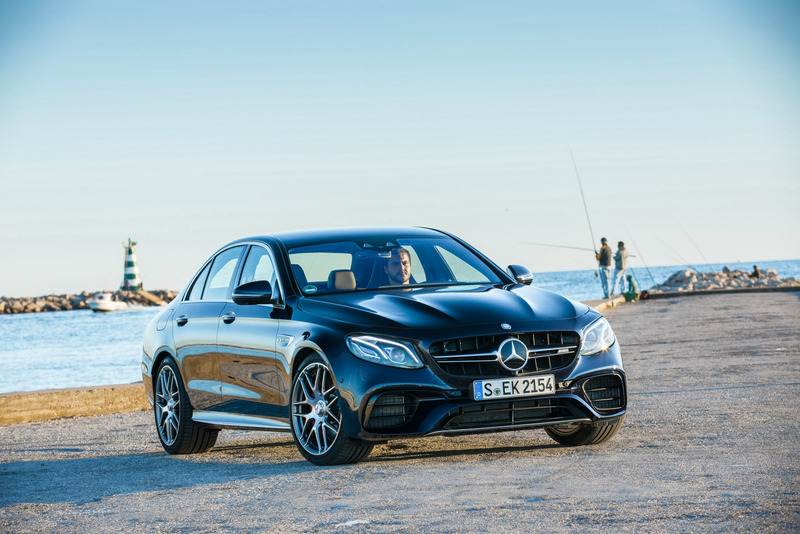 Here too the car shows its diverse identity, delivering dazzling performance on one end of the spectrum while setting the benchmark in efficiency on the other end. 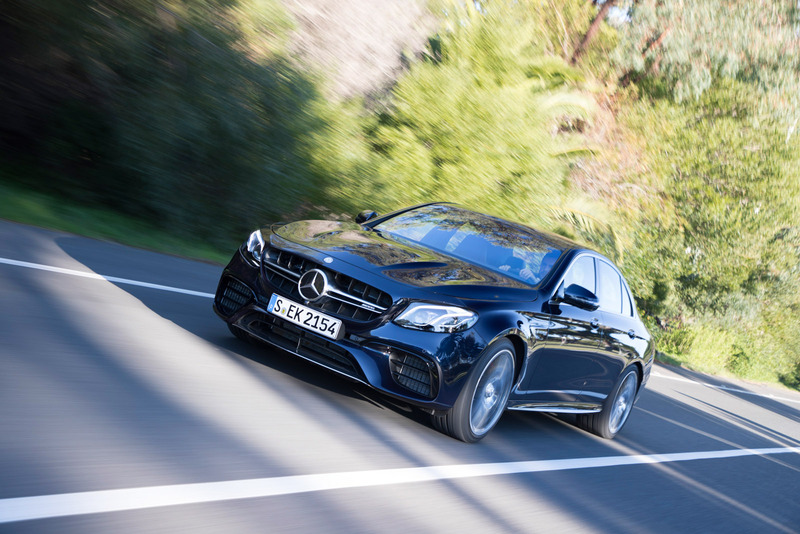 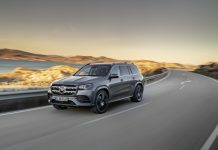 To make things even more comfortable, the range of driver assistance systems that were introduced on the E-Class earlier this year also become available for the E63 AMG. 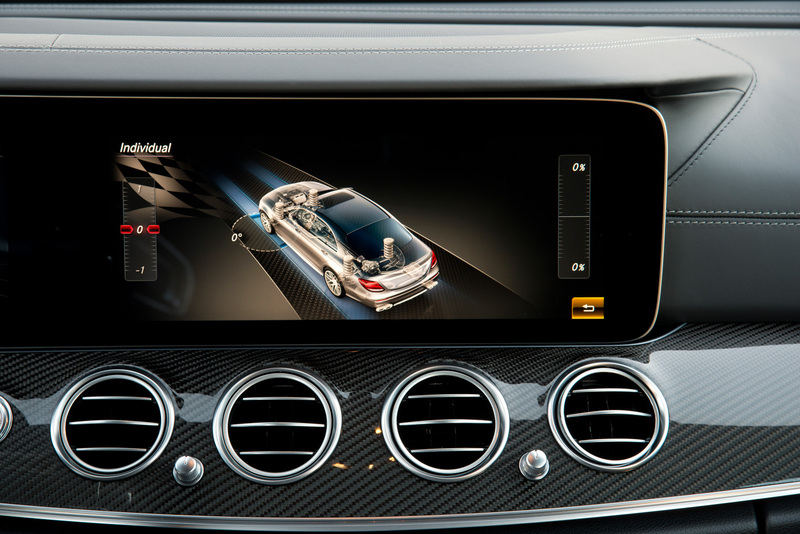 Highlight is without doubt the semi-autonomous DRIVE PILOT which I tested thoroughly before and works like a charm. 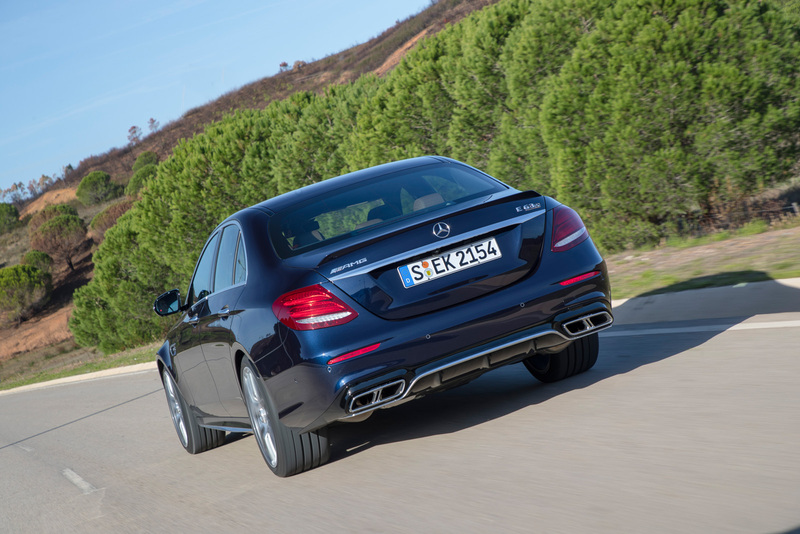 Lean back, let the car do all the work and for a short moment forget about the monstrous capabilities it has. 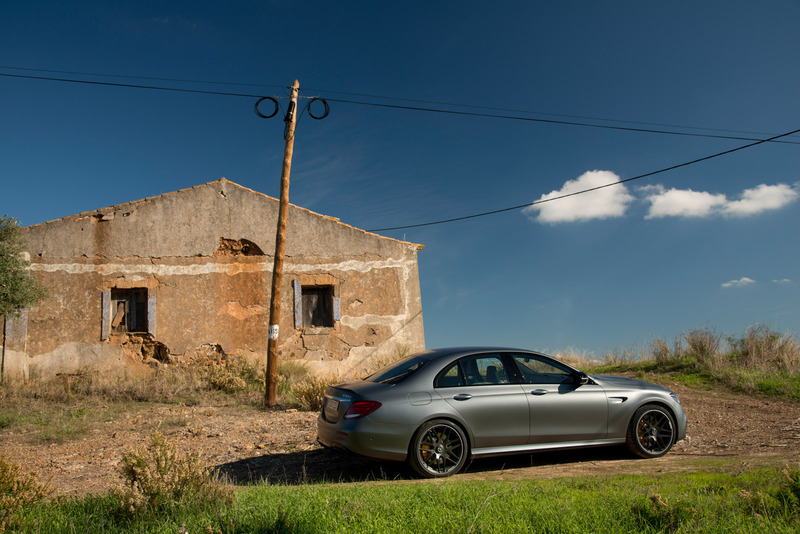 As relaxing as that sounds, my objective was to push the E63 through its paces and so I got back to it by a simple switch to sport plus. 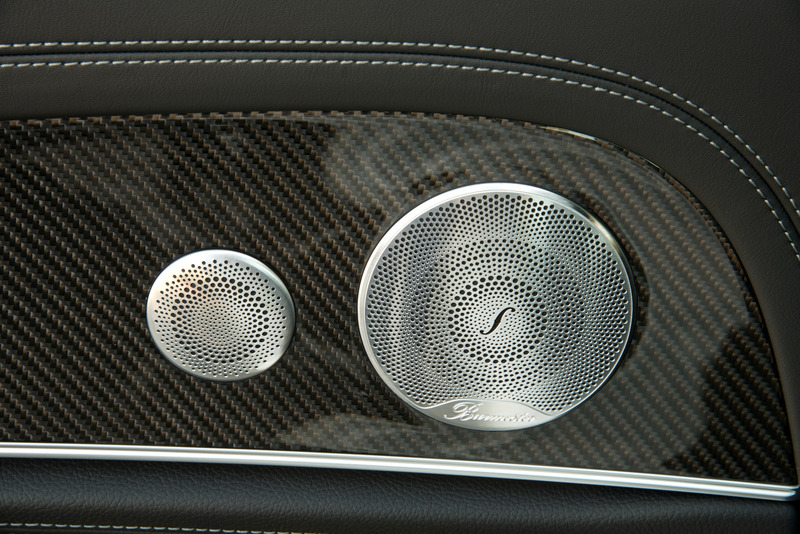 The low-edged soundtrack returns immediately and immediately brings a smile to my face. 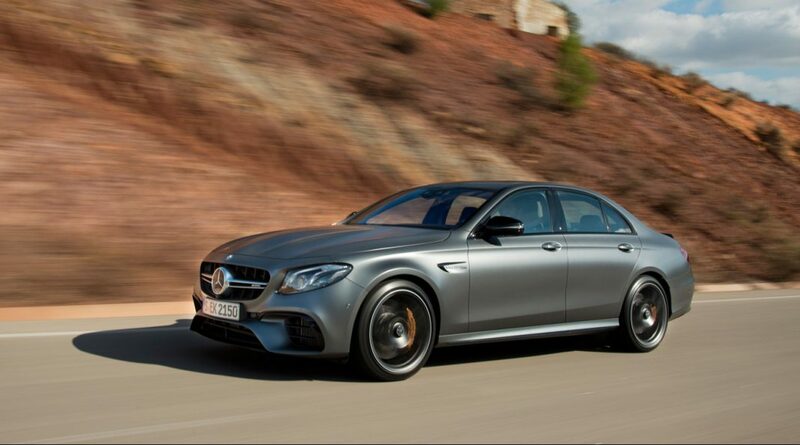 That is the beauty of the new Mercedes-AMG E63 S, a true all-rounder with many different faces. 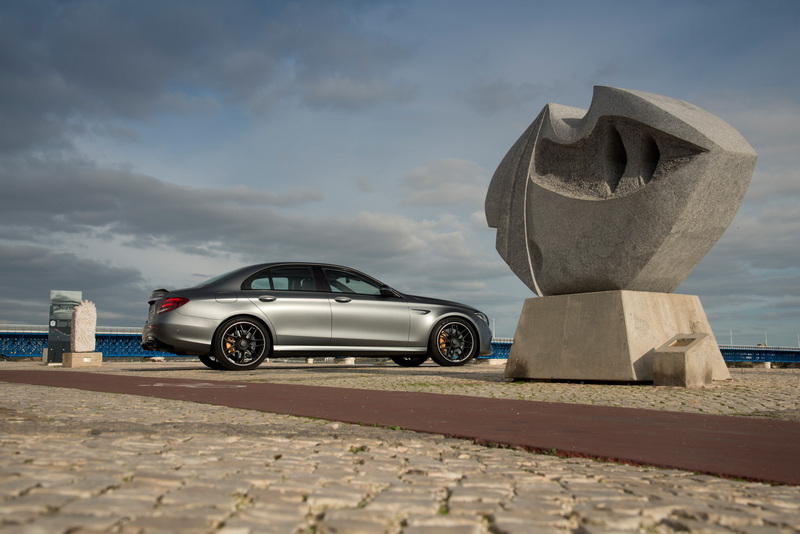 As I am on my way back to the racetrack, I cannot resist going for a quick loop through the nearby coastal city Lagos and make the V8 burbles echo through the streets. 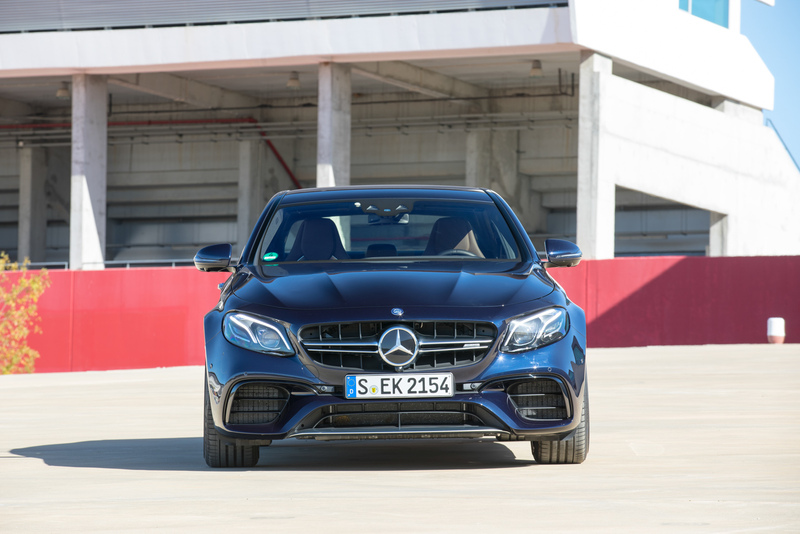 When it comes to competition there is traditionally one arch-rival to be reckoned with coming from the Bavarian capital Munich. 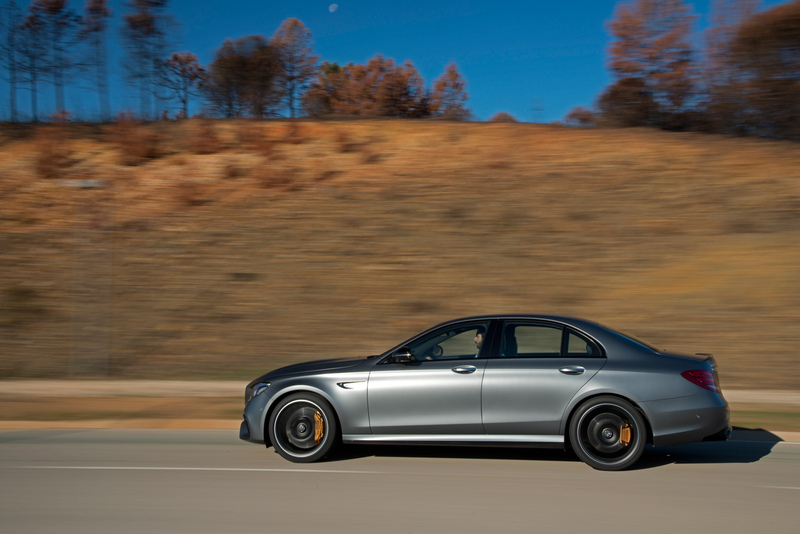 The new BMW 5 Series is being rolled out as we speak and the waiting game has started to see what the M5 will bring to the table. 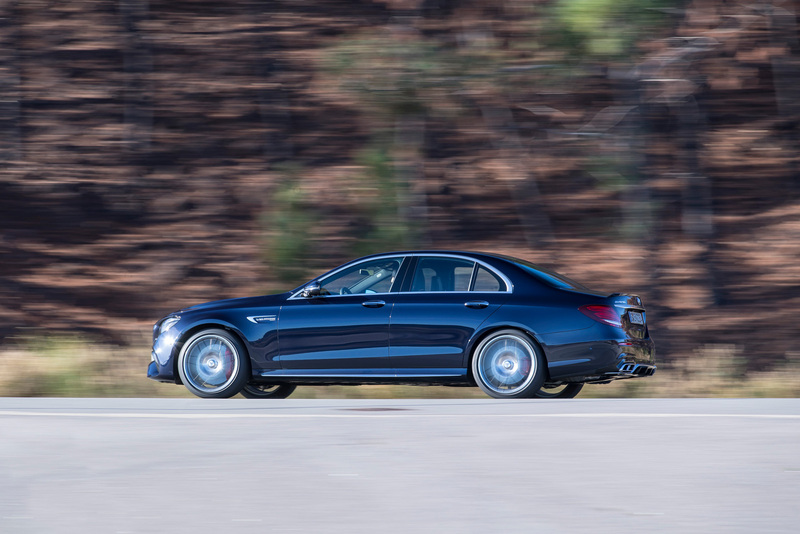 For now we only know about the M550i powered by a V8 and good for 452 hp. 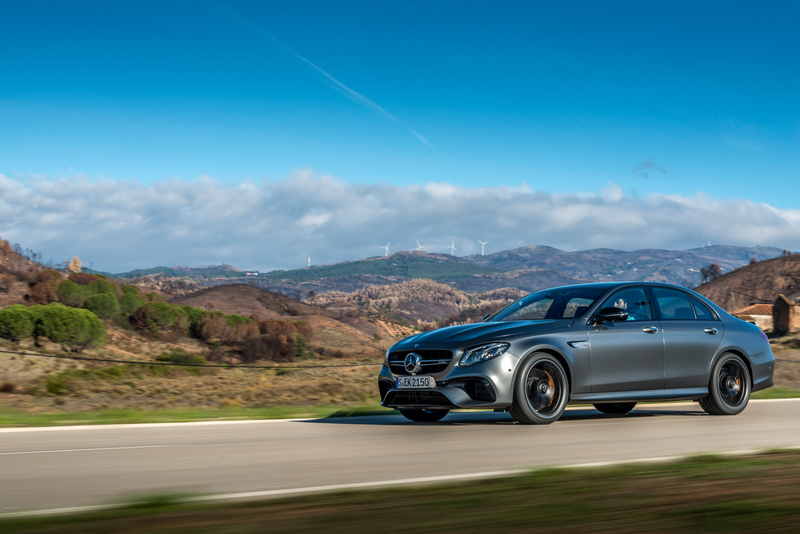 All gets a little bit more intense in the wagon segment, where the RS6 Avant maintains a stronghold position with its 605 hp V8 specification. 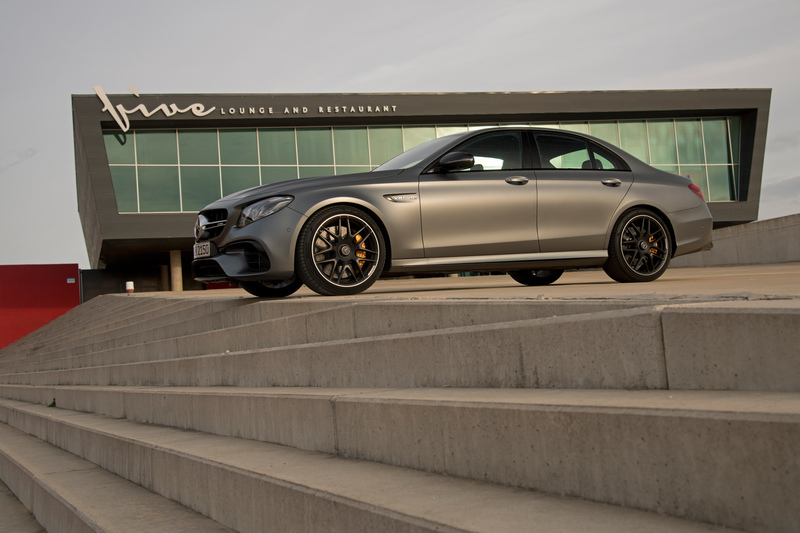 The A6 too is soon due for an update, so until then the new E63 S has time to set the rules of the game and patiently wait for what is to come. 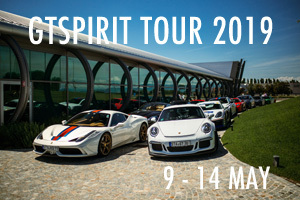 Prices are yet to be released and is something that for now I can only speculate about. 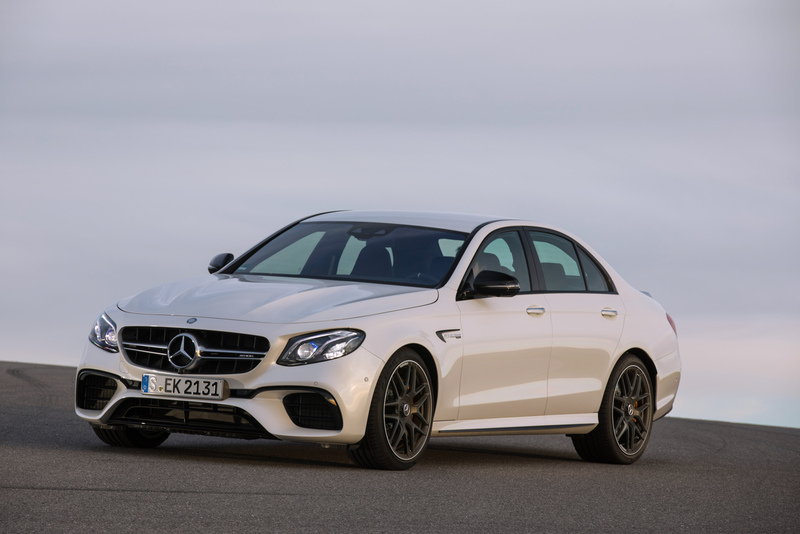 In Germany the C63 S starts from €84,000 and the car’s predecessor started just shy of €120,000, which leads me to believe that you are looking at a figure well beyond €100,000. 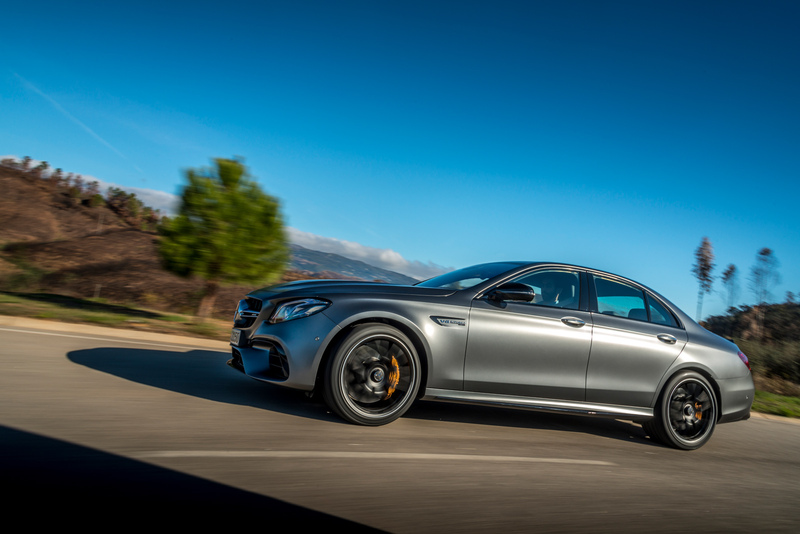 The new Mercedes-AMG E63 S goes on sale in January 2017 and will arrive in showrooms from March 2017. 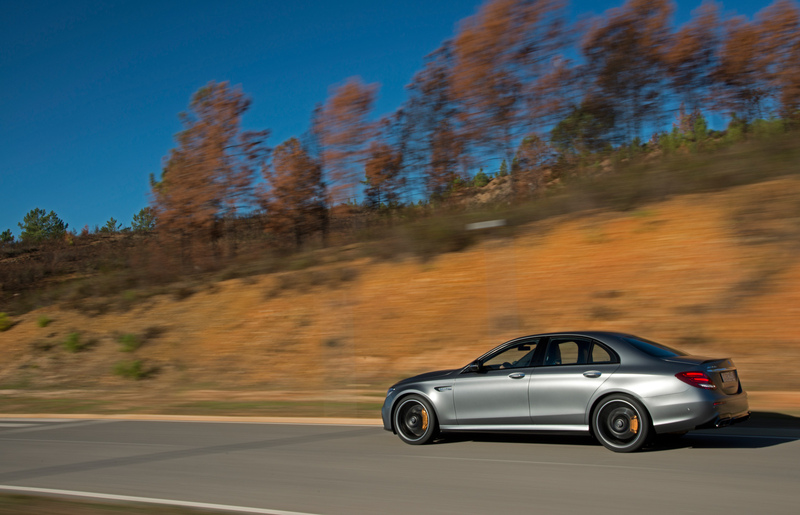 Looking back at my ‘wet’ experience with the brand new E63 I feel that it scares and comforts me at the same time. 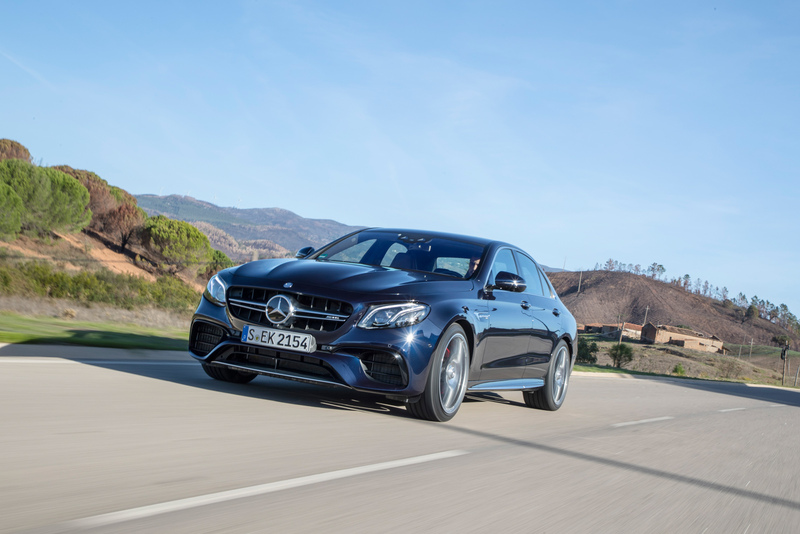 Standard 4MATIC+ AWD balances the car and its obliterating performance courtesy of a fully reworked 4.0-liter V8 Biturbo. 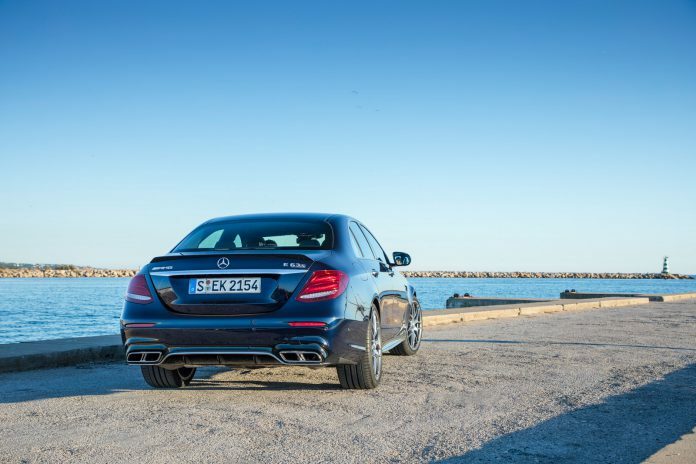 It eats up tarmac in a straight line like no other car in its class but at times it may proof difficult to keep in line, which can be both intimidating and fun, depending on how you look at it. 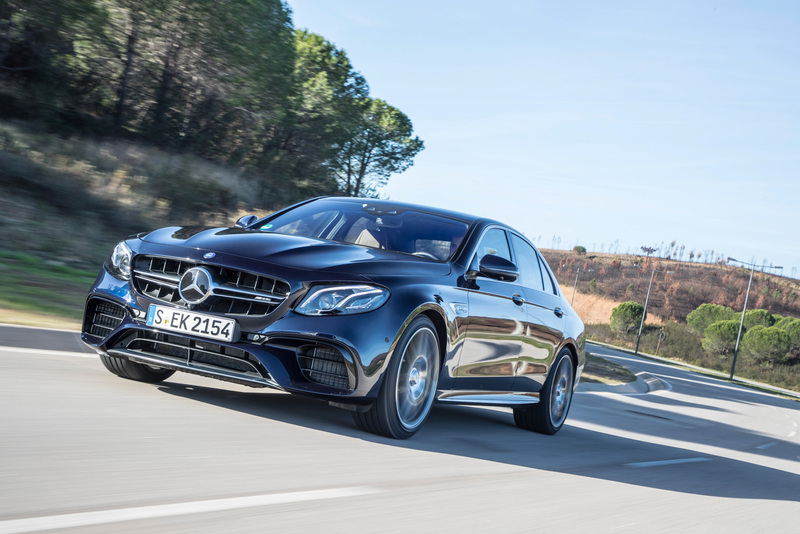 That does not take away the fact that it is without a doubt the most capable car currently in its segment, setting the benchmark in performance, comfort, efficiency and intelligence. 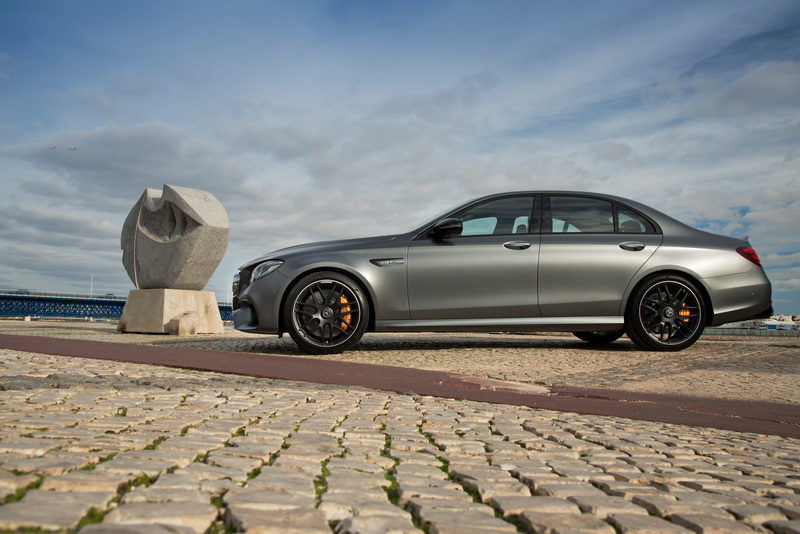 The Mercedes-AMG E63 S should top your shopping list if you are in the market for the ultimate performance saloon but do not want to compromise on other aspects such as comfort and the ability to use it as a daily driver. 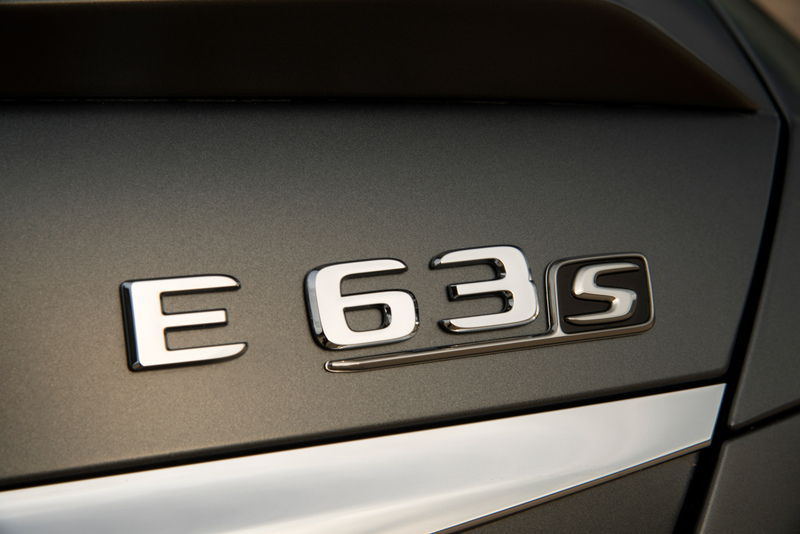 Looking back at my ‘wet’ experience with the brand new E63 I feel that it scares and comforts me at the same time. 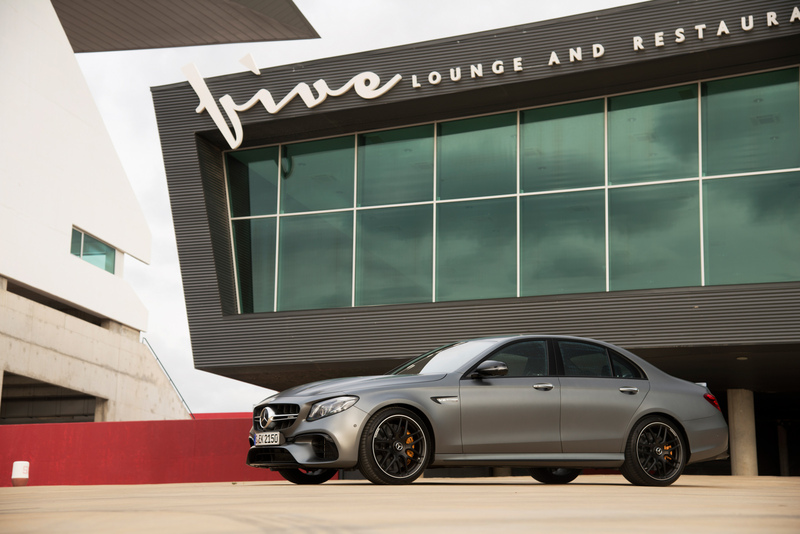 Standard 4MATIC+ AWD balances the car and its obliterating performance courtesy of a fully reworked 4.0-liter V8 Biturbo. 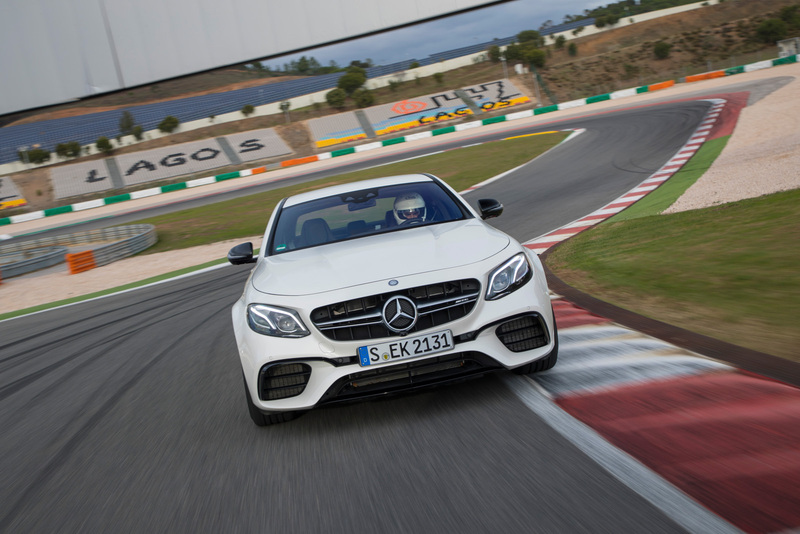 It eats up tarmac in a straight line like no other car in its class but at times it may proof difficult to keep in line, which can be both intimidating and fun, depending on how you look at it. That does not take away the fact that it is without a doubt the most capable car currently in its segment, setting the benchmark in performance, comfort, efficiency and intelligence. 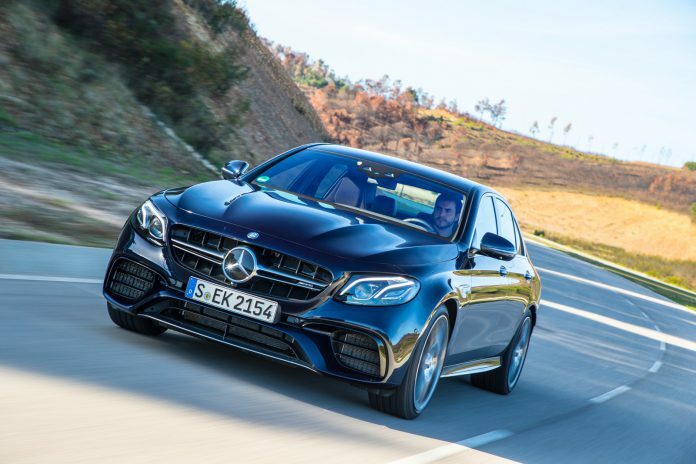 The Mercedes-AMG E63 S should top your shopping list if you are in the market for the ultimate performance saloon but do not want to compromise on other aspects such as comfort and the ability to use it as a daily driver.